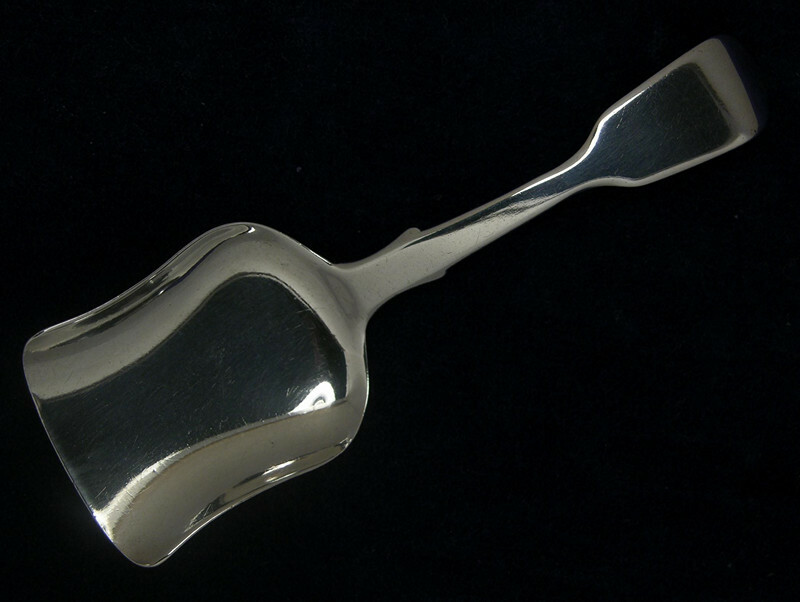 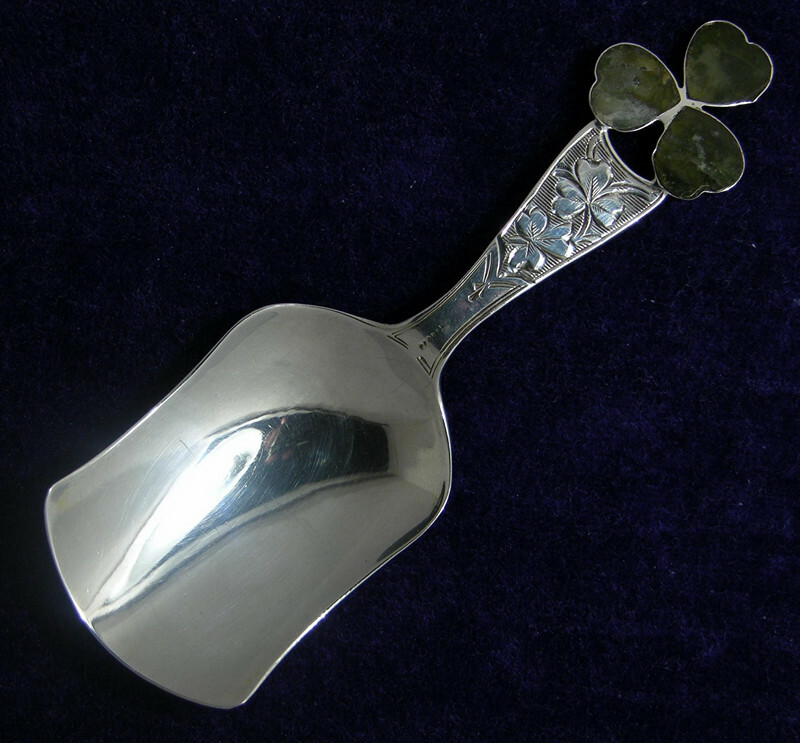 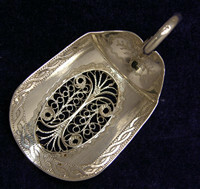 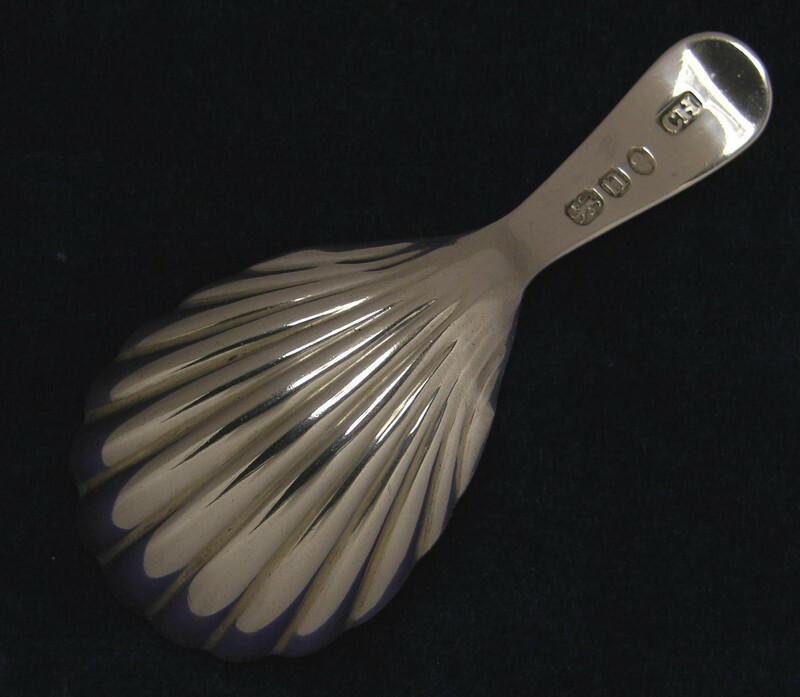 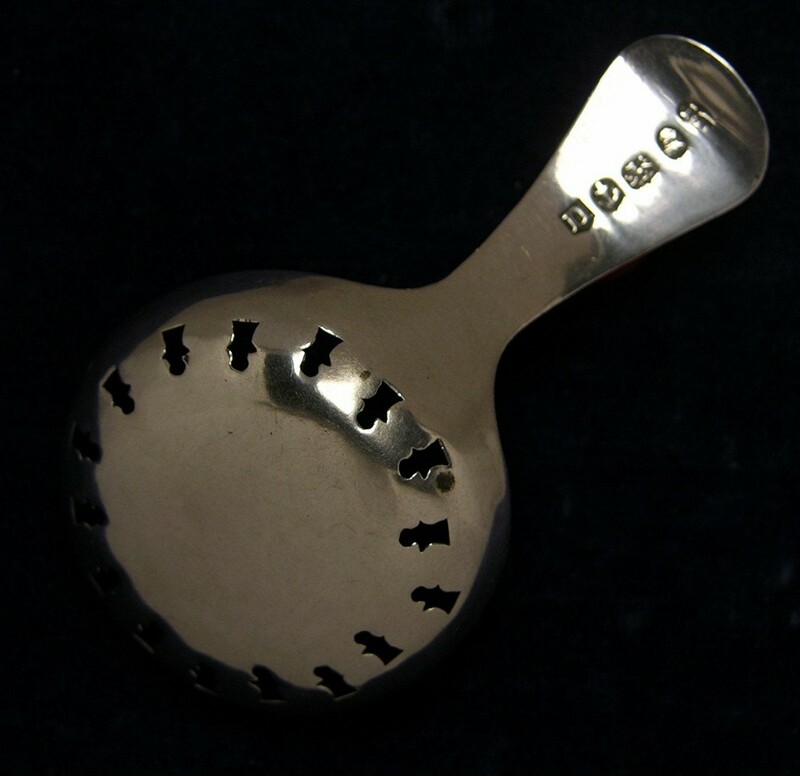 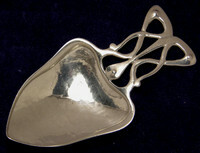 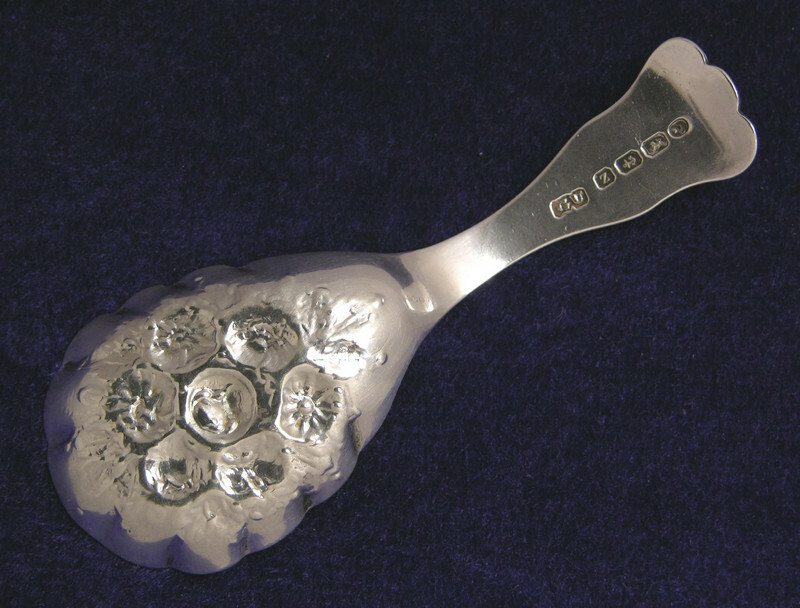 To purchase, or receive further information on any of the caddy spoons illustrated, click the appropriate link to the right hand side of each item. 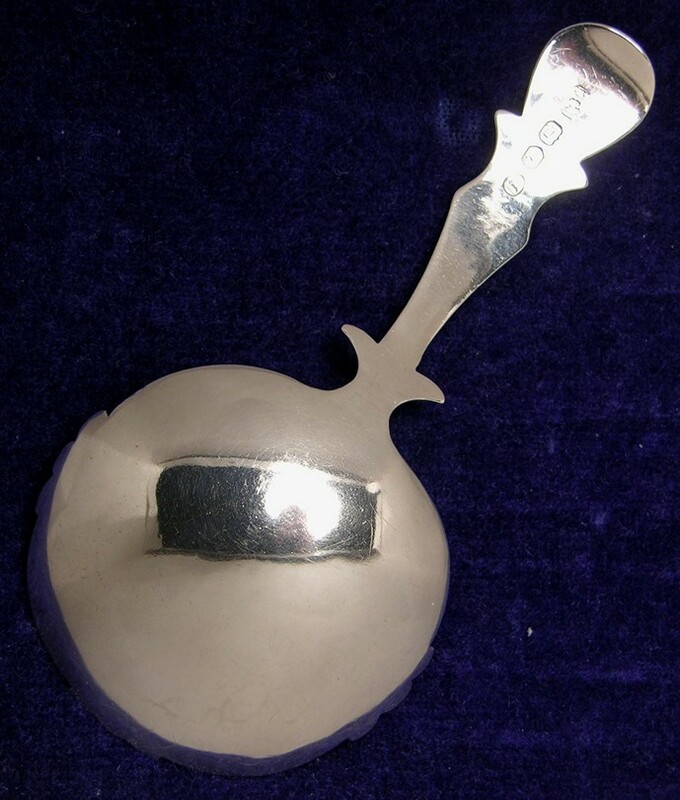 Alternatively, or telephone. 7341 - A GEO.III. 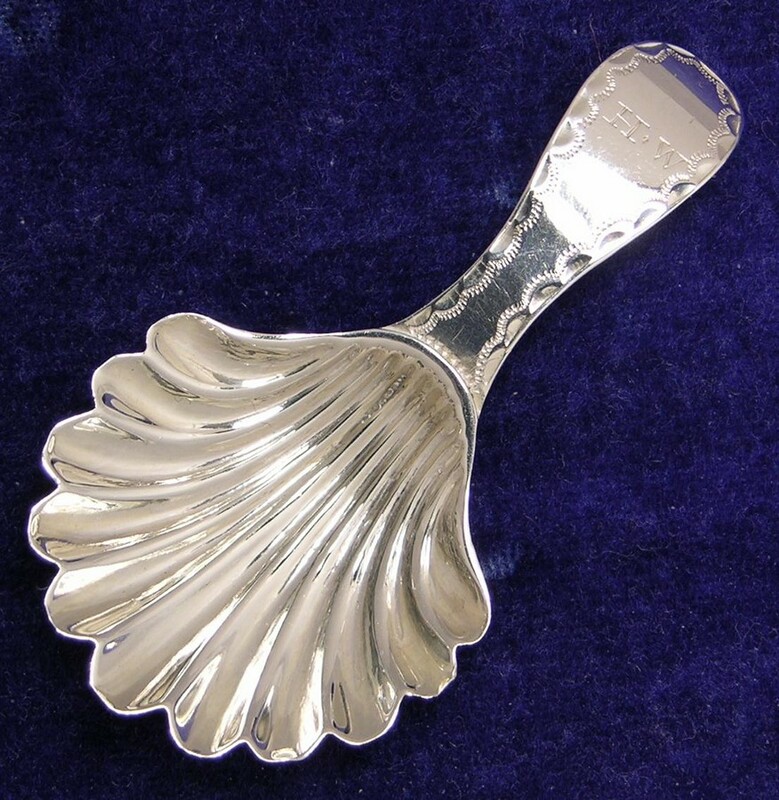 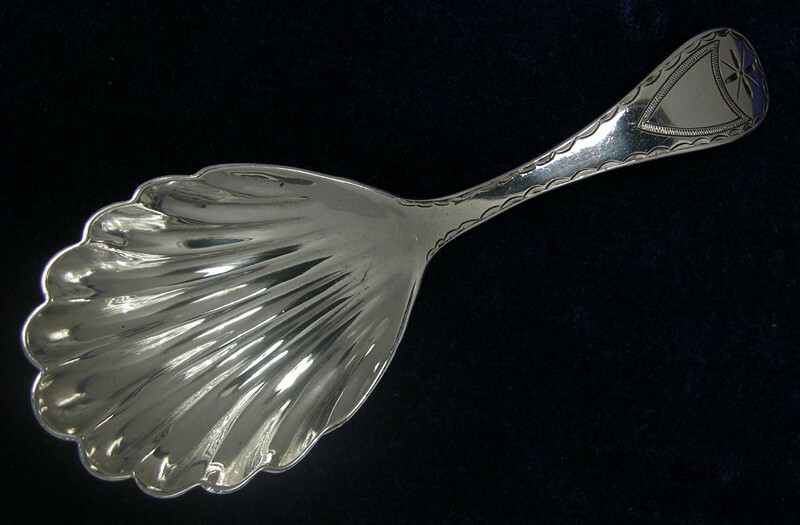 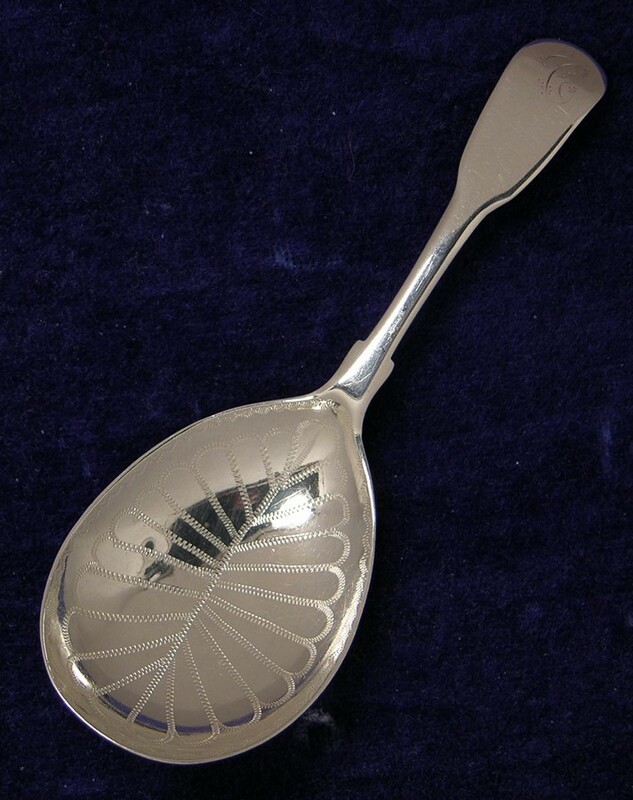 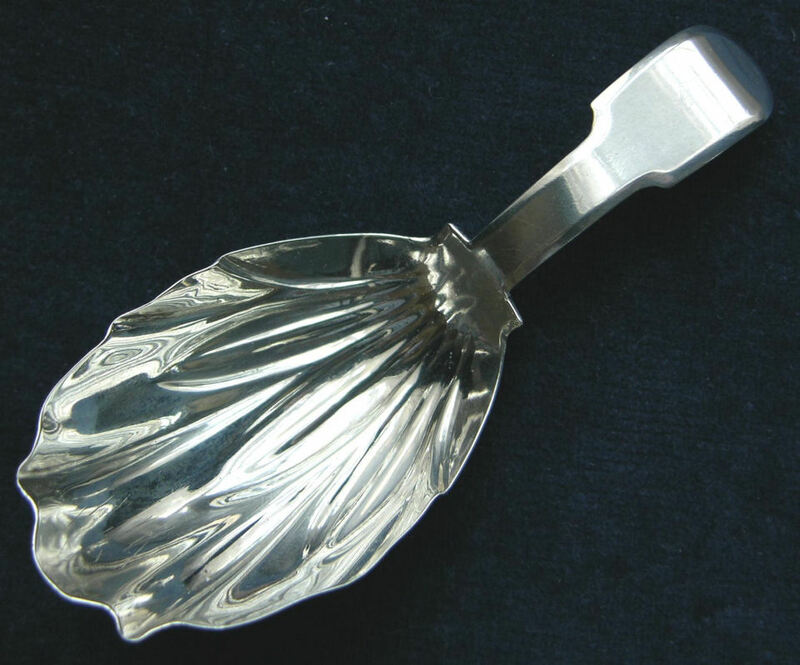 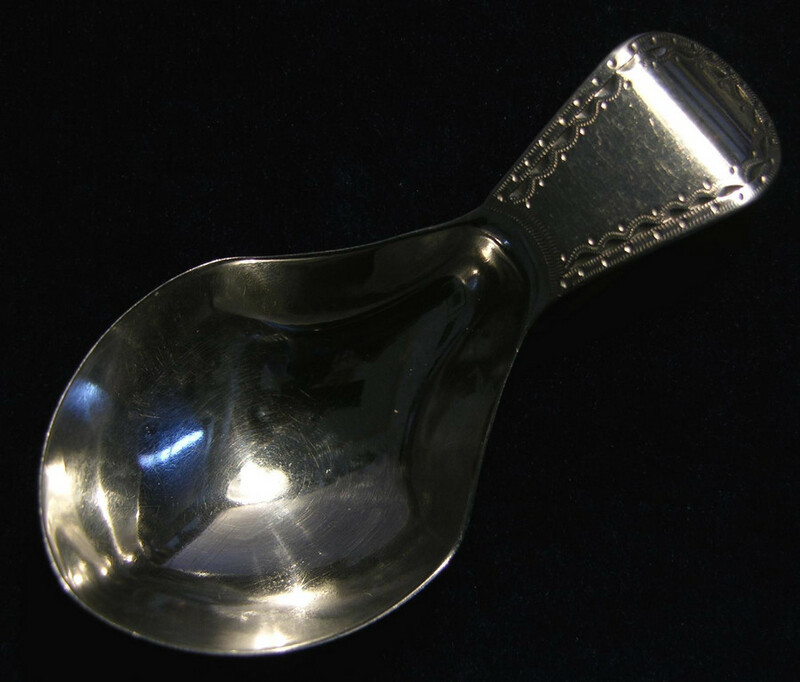 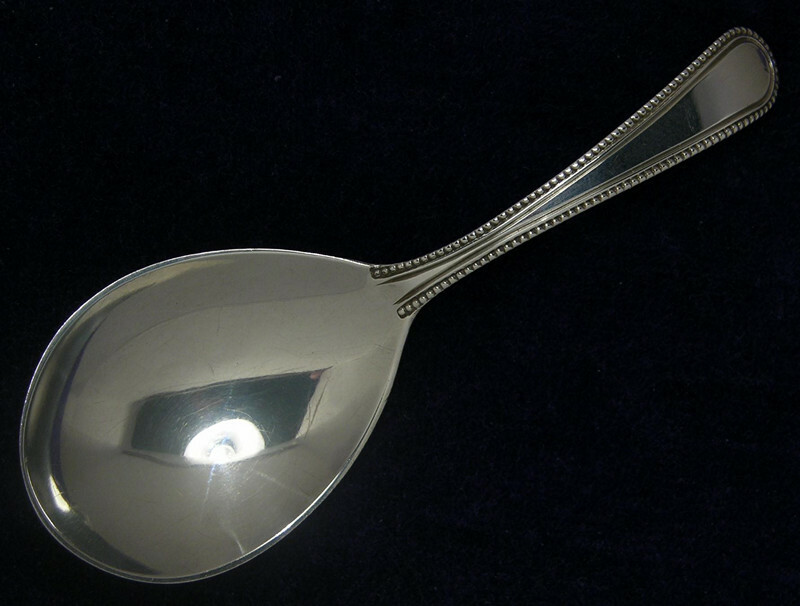 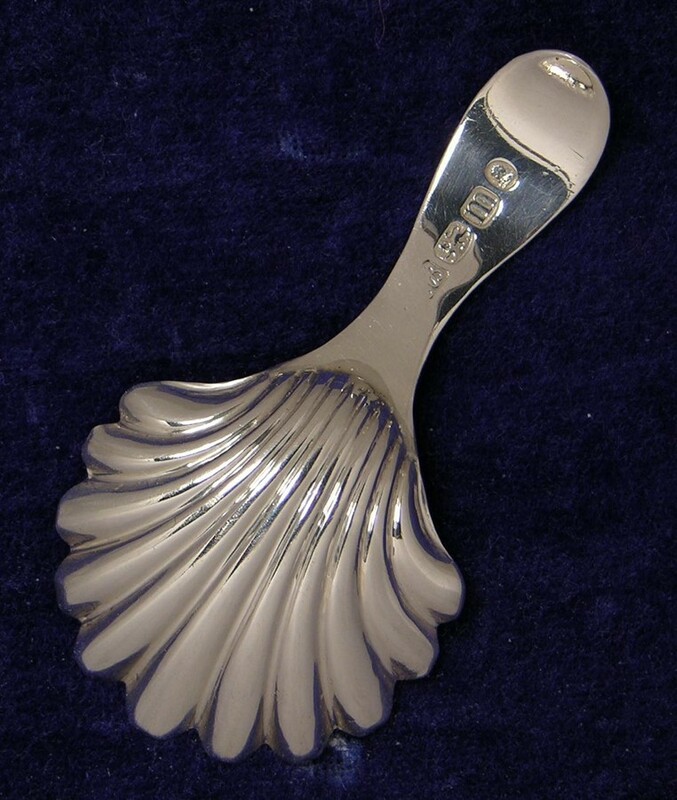 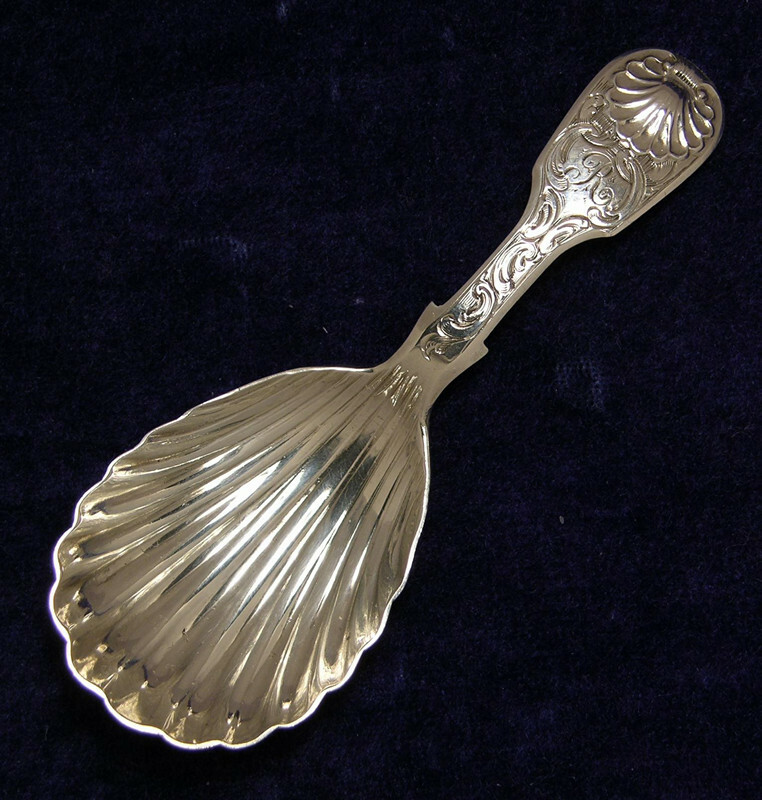 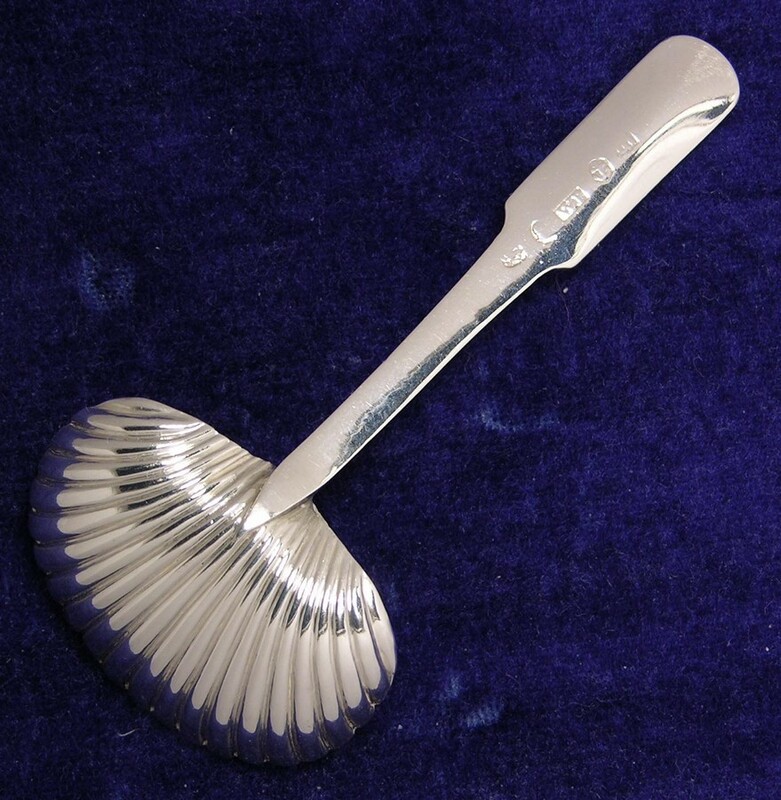 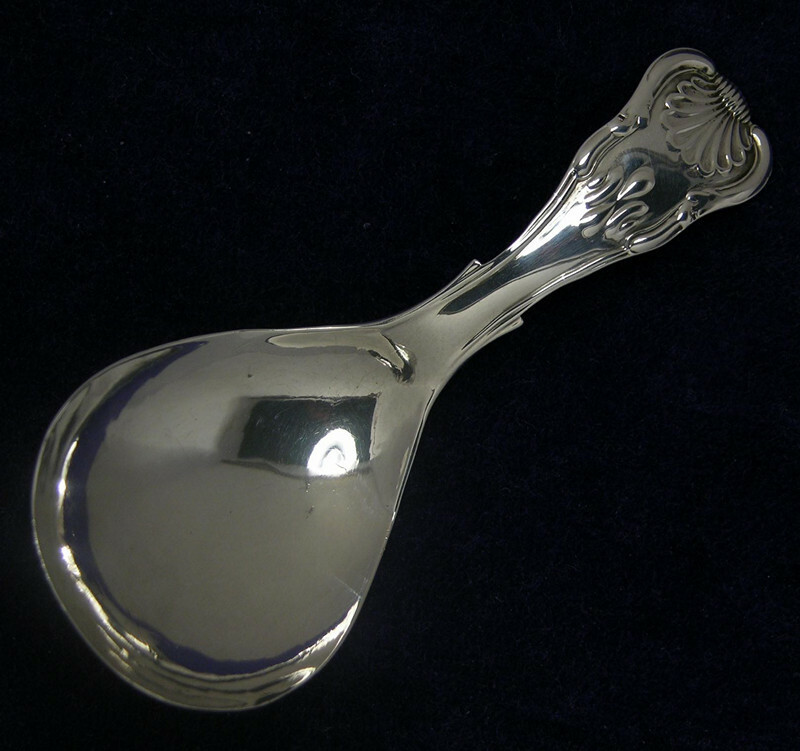 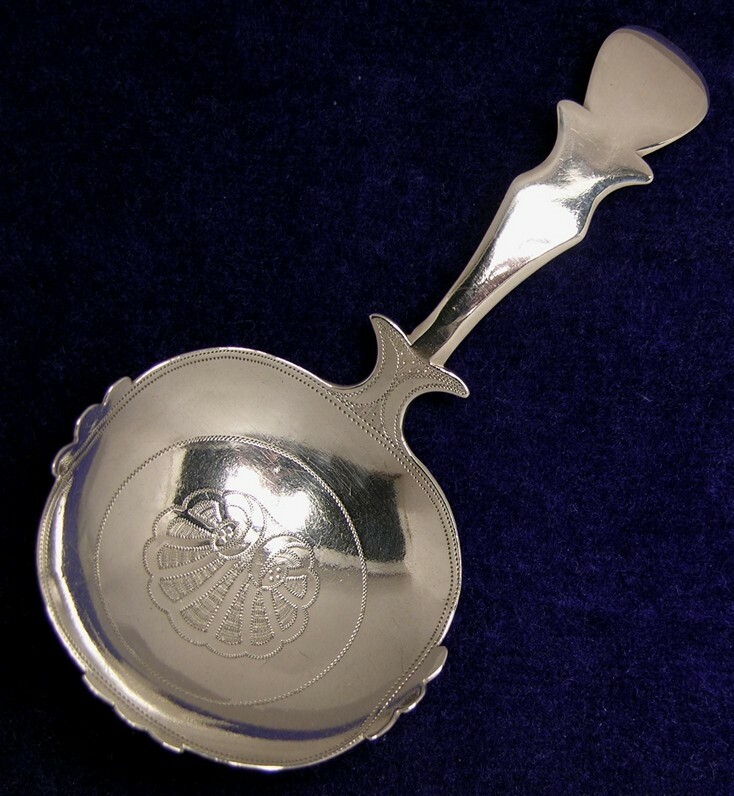 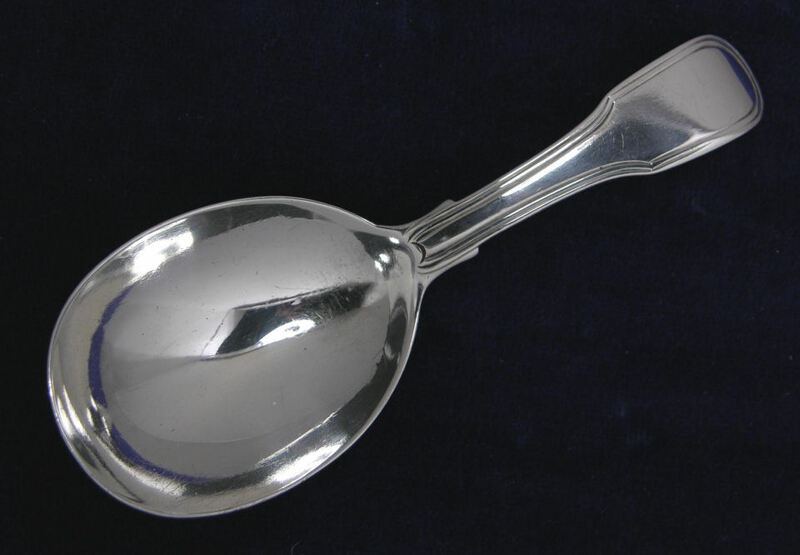 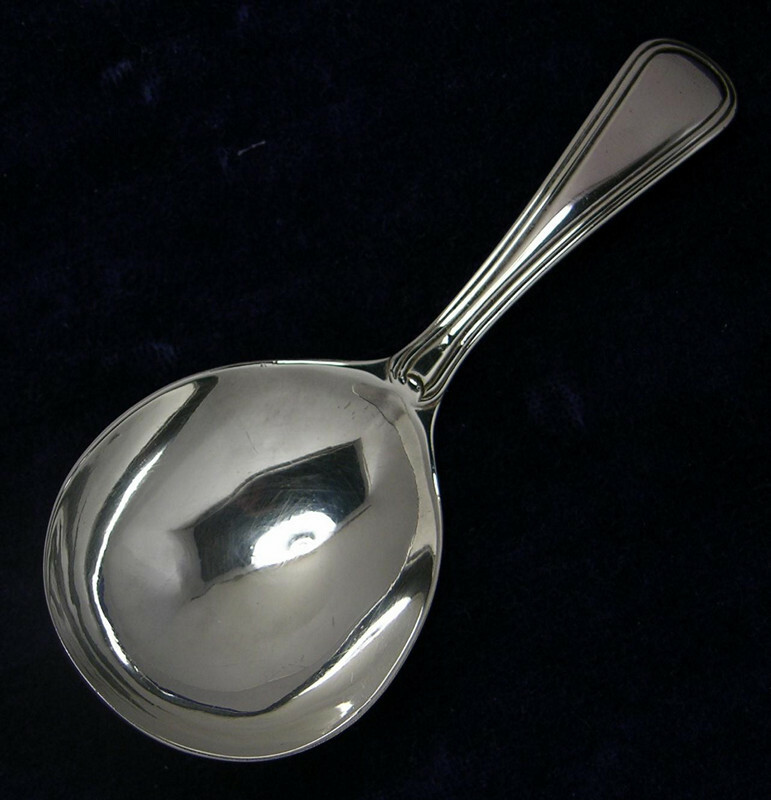 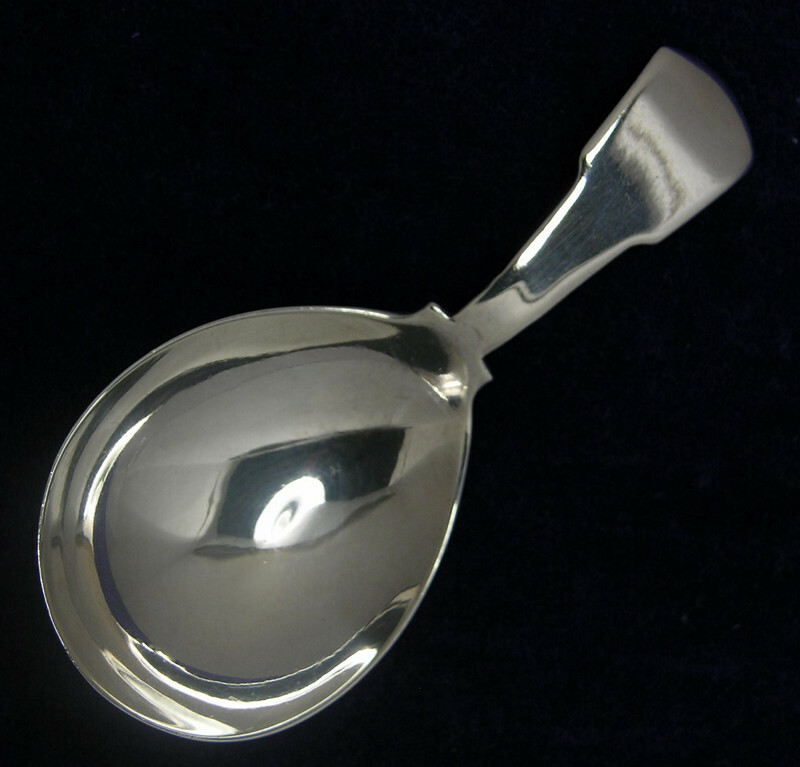 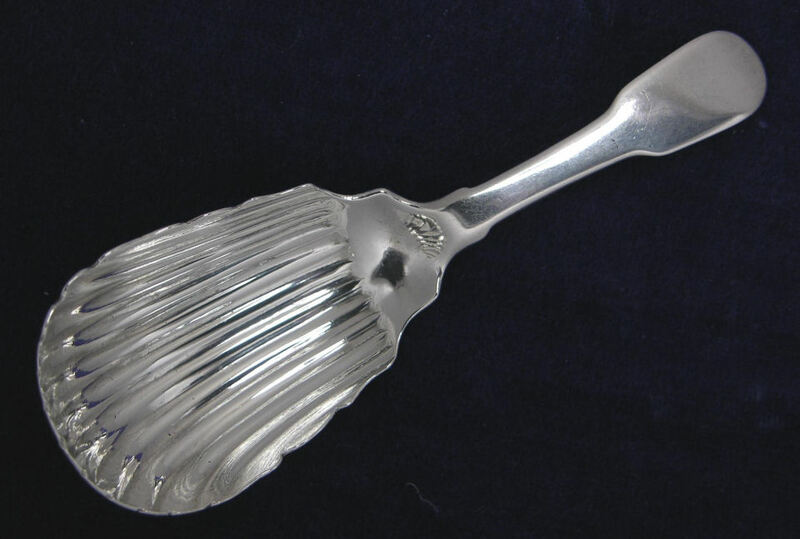 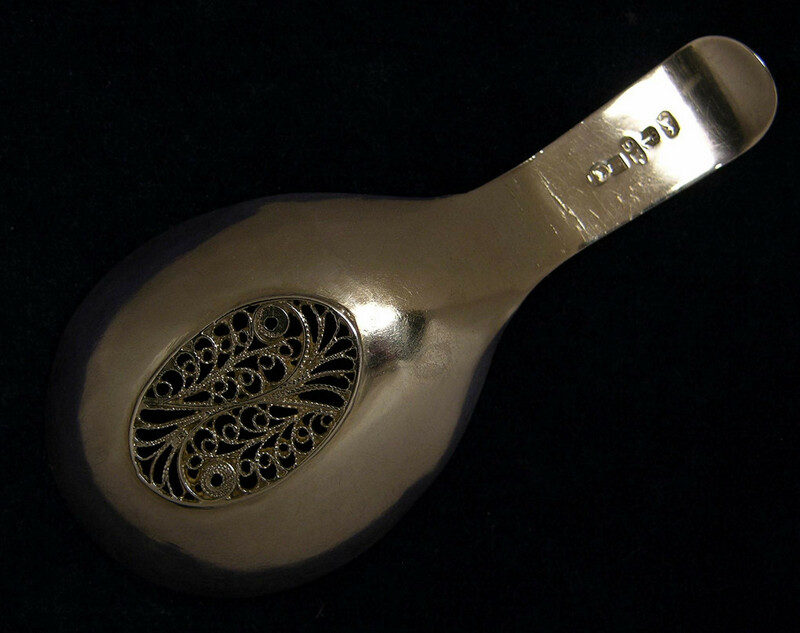 CADDY SPOON - LONG FLUTED BOWL WITH BRIGHT ENGRAVED HANDLE - BY: 'CHARLES HOUGHAM' - LONDON 1788. 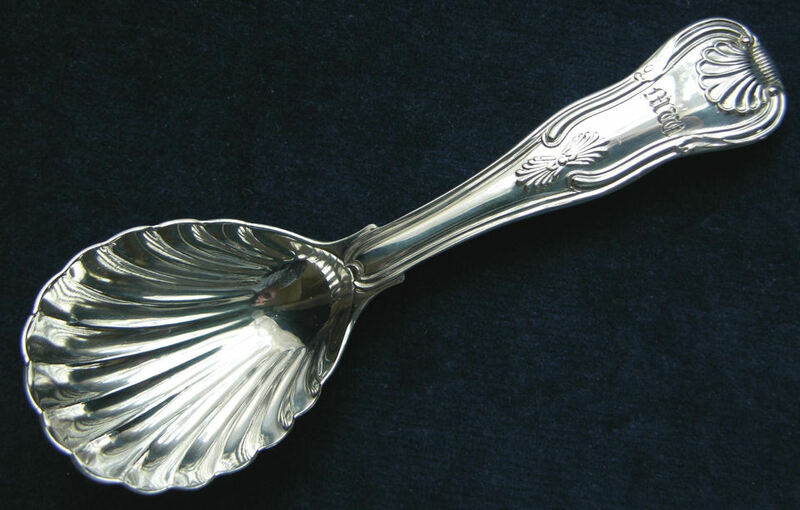 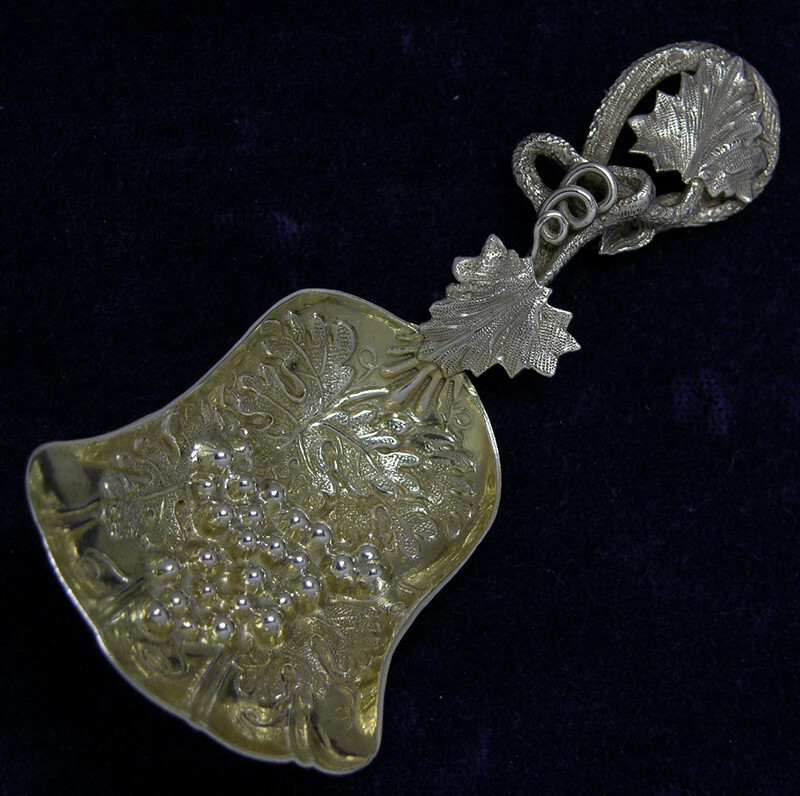 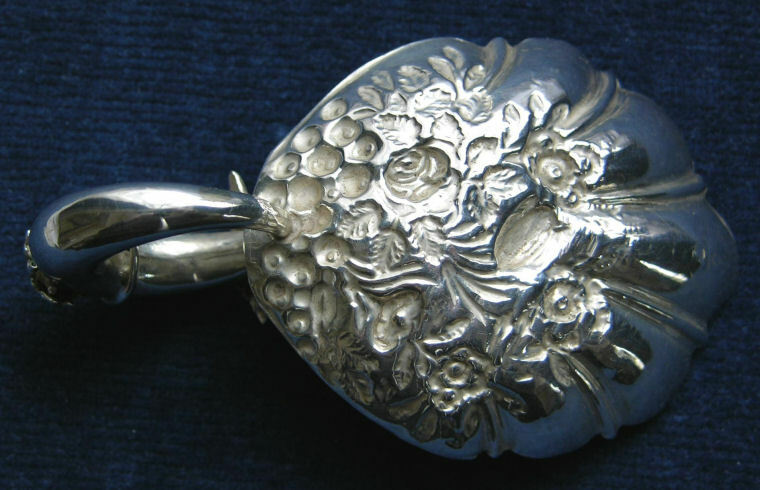 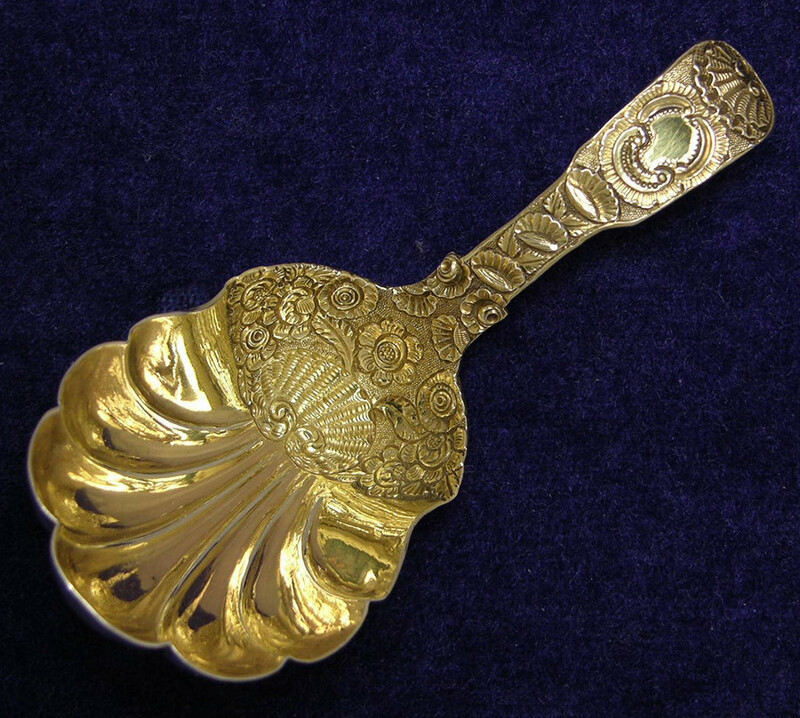 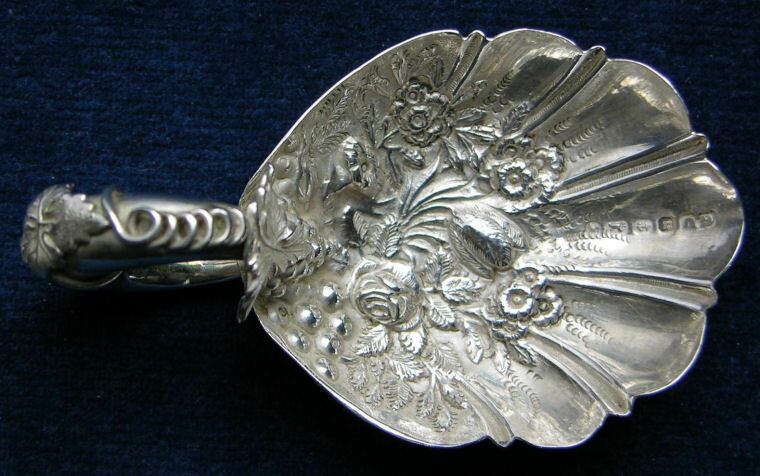 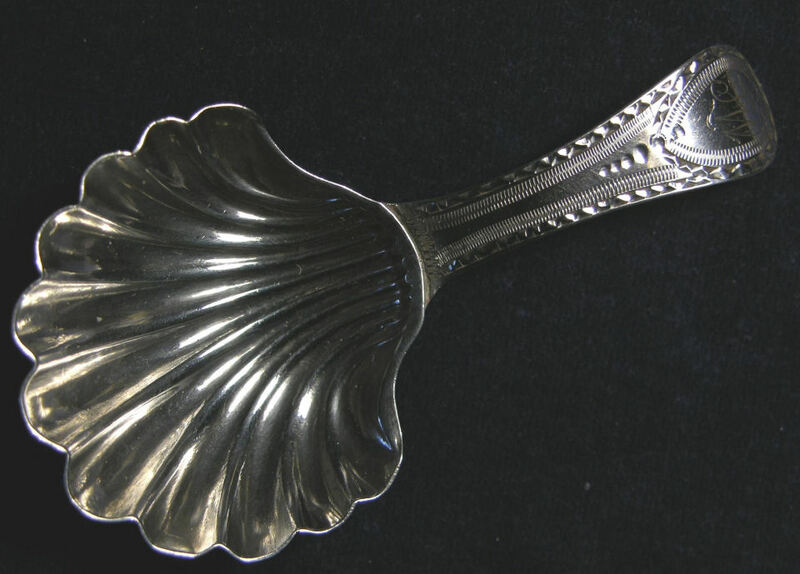 7337 - A 'CHARMING' EARLY VICTORIAN CADDY SPOON - THE TEARDROP SHAPED BOWL WITH FLUTED BORDER & FINELY EMBOSSED WITH FLOWERS - THE SHAPED HANDLE WITH ENGRAVED DECORATION - BY: 'GEORGE UNITE' - BIRMINGHAM 1848. 7252 - A GEO.III. 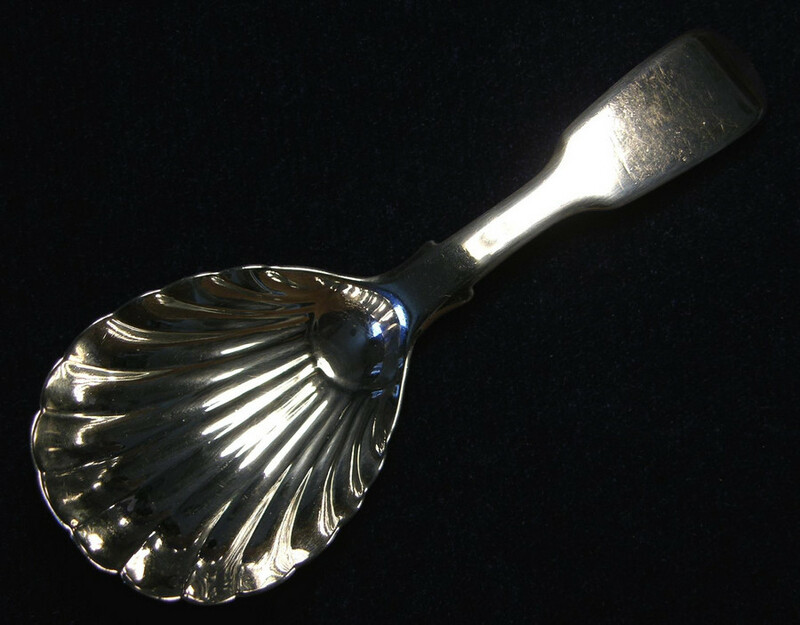 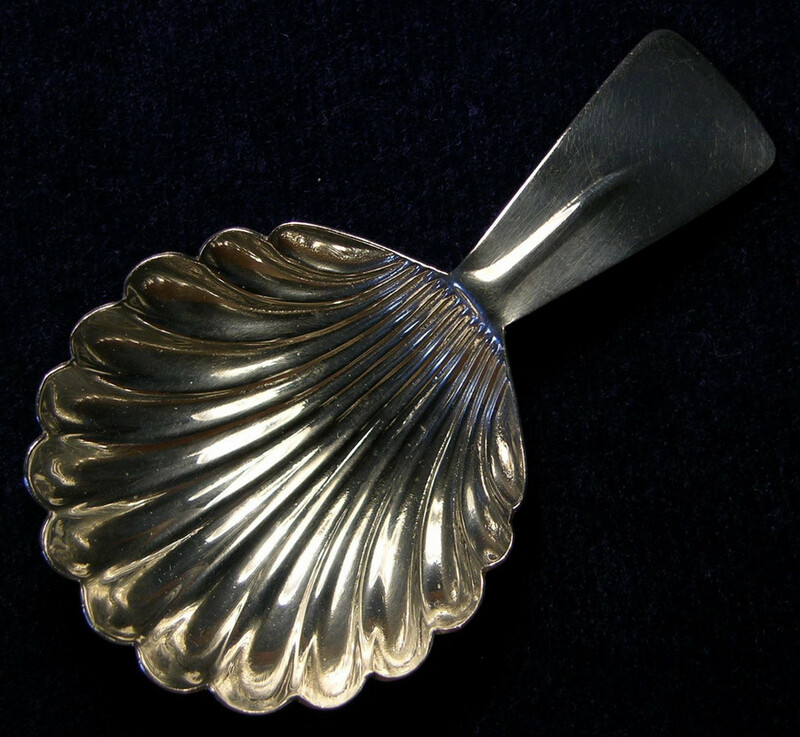 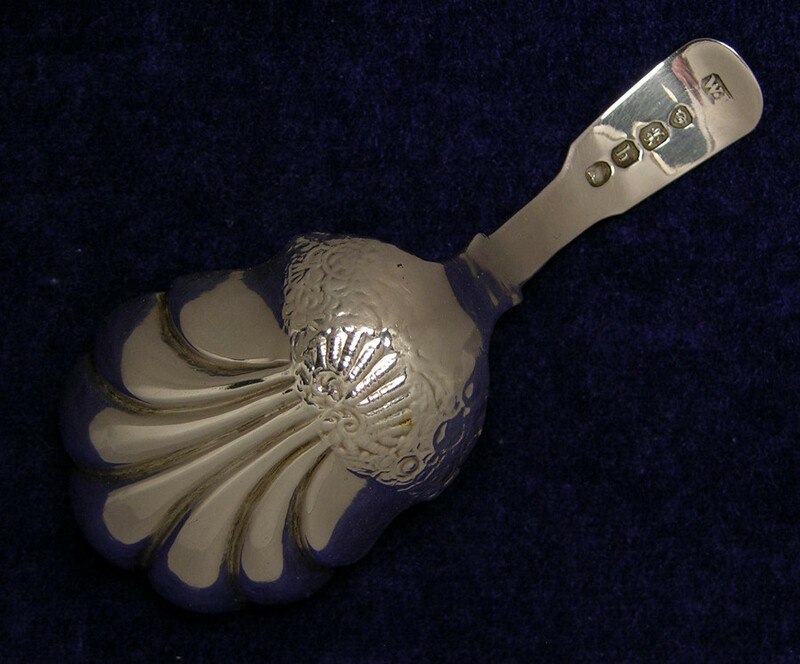 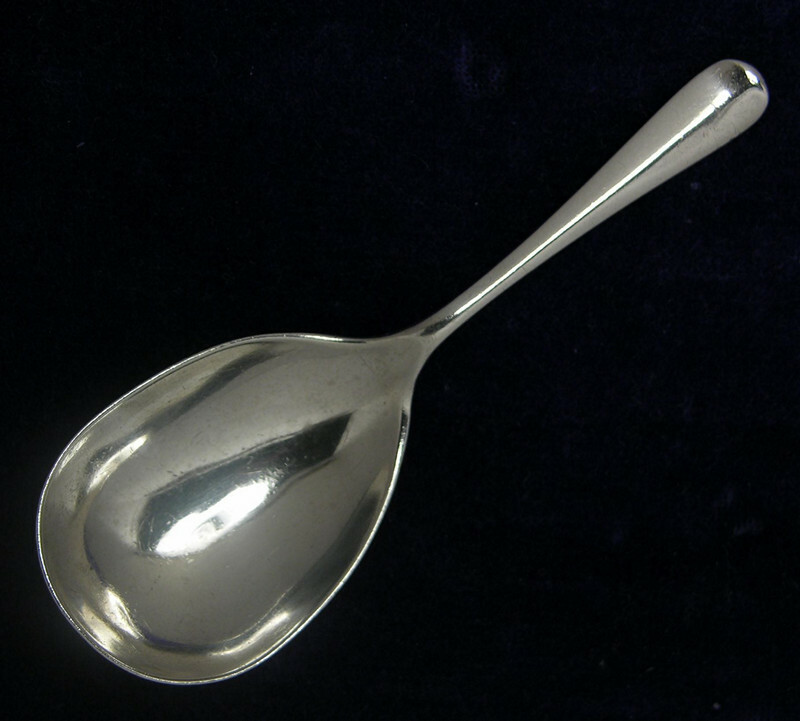 CADDY SPOON - THE FLUTED BOWL WITH BRIGHT ENGRAVED HANDLE - BY: 'GEORGE SMITH' AND STRUCK WITH THE INCUSE DUTY MARK FOR: LONDON 1784. 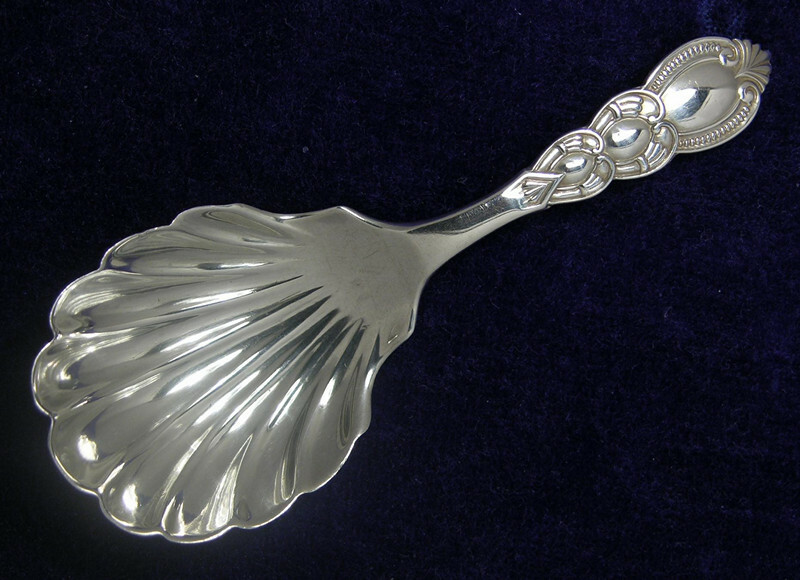 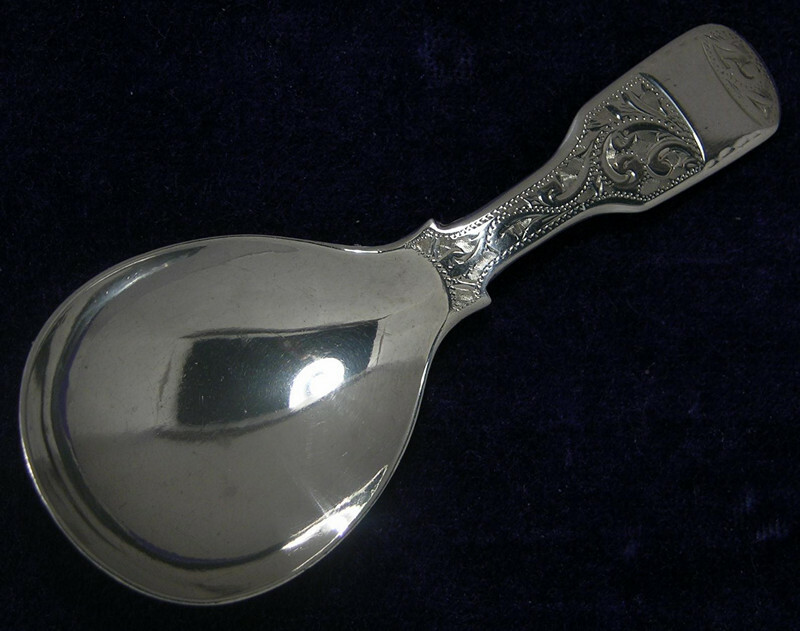 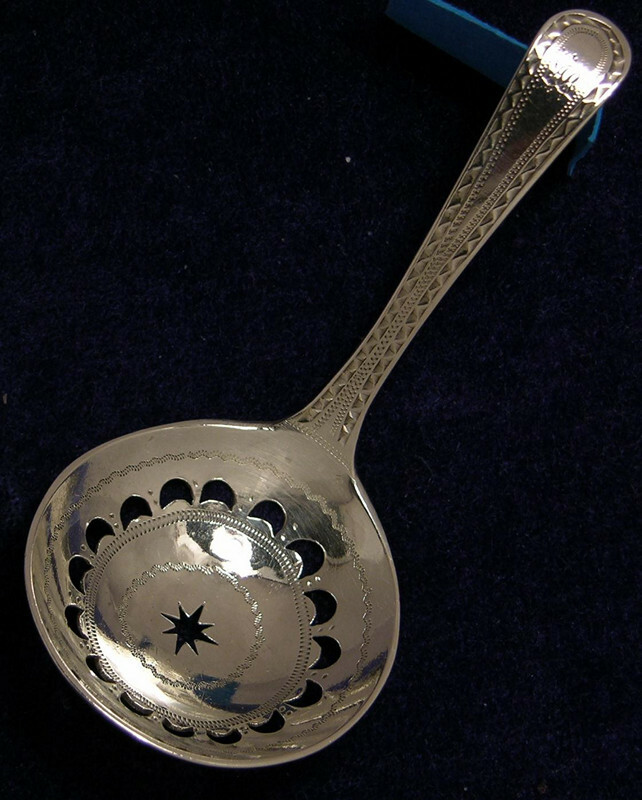 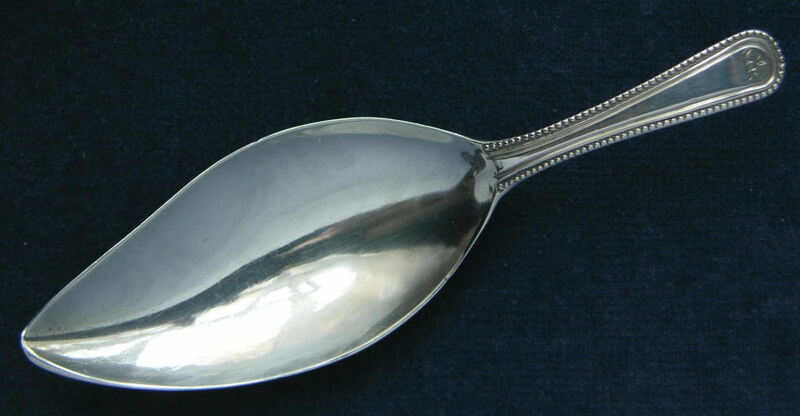 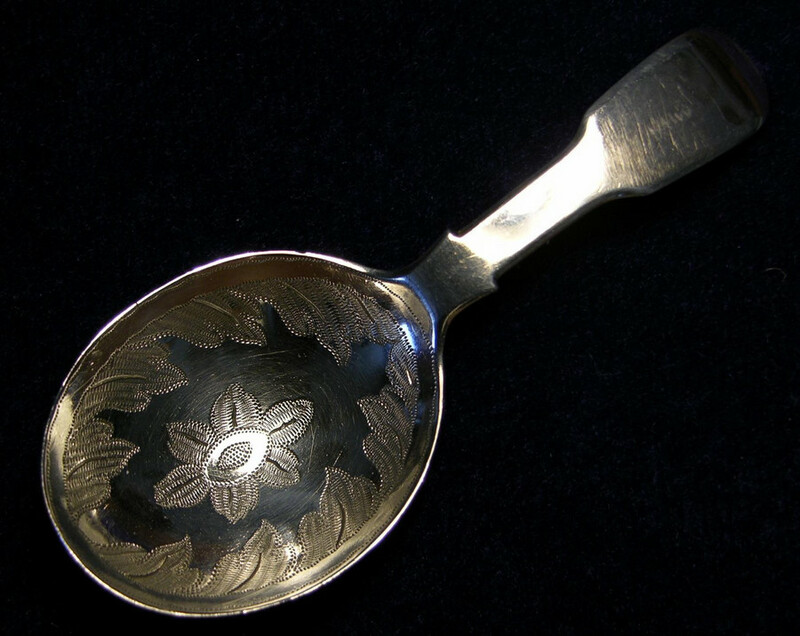 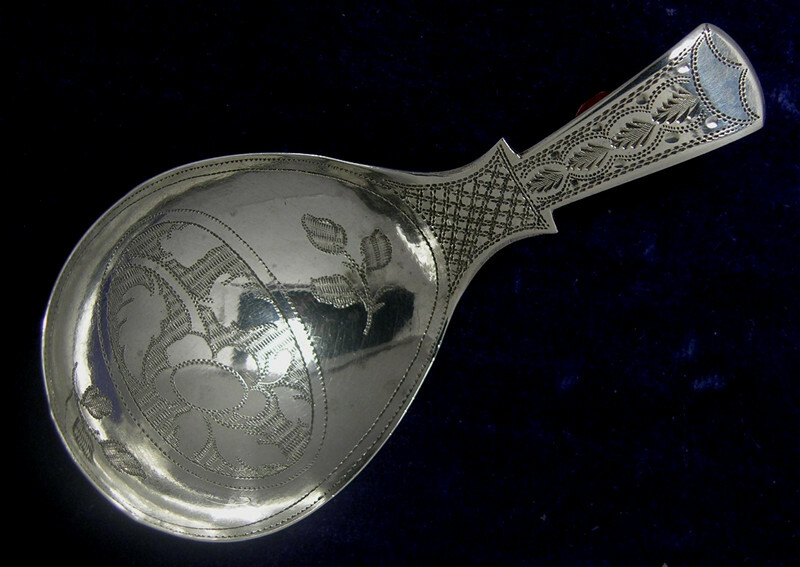 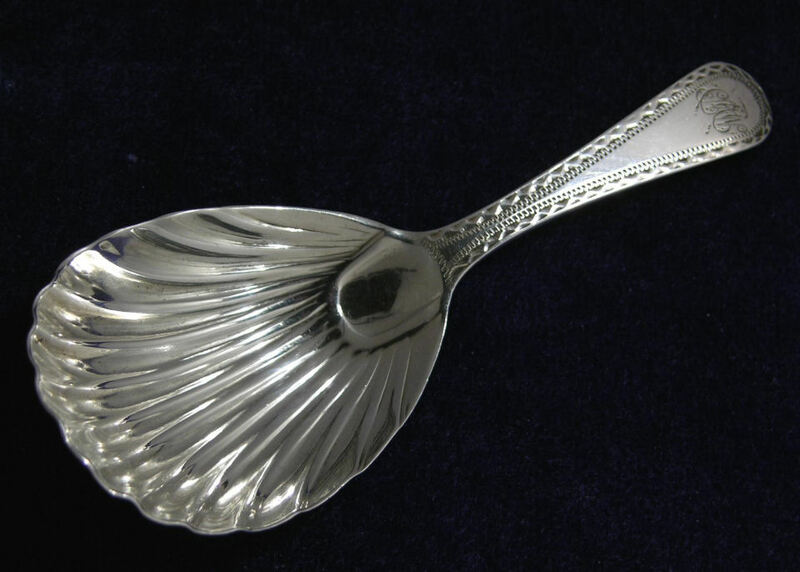 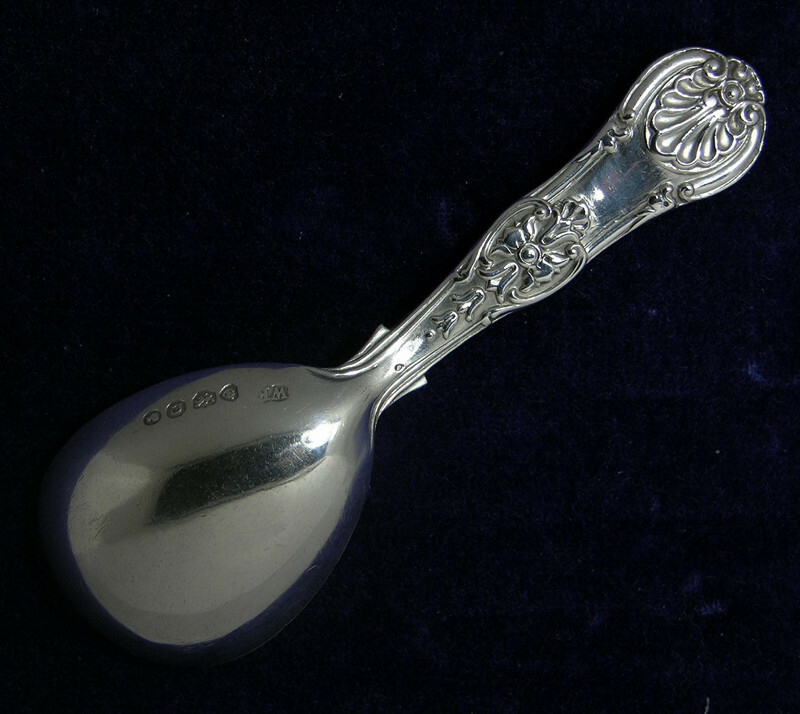 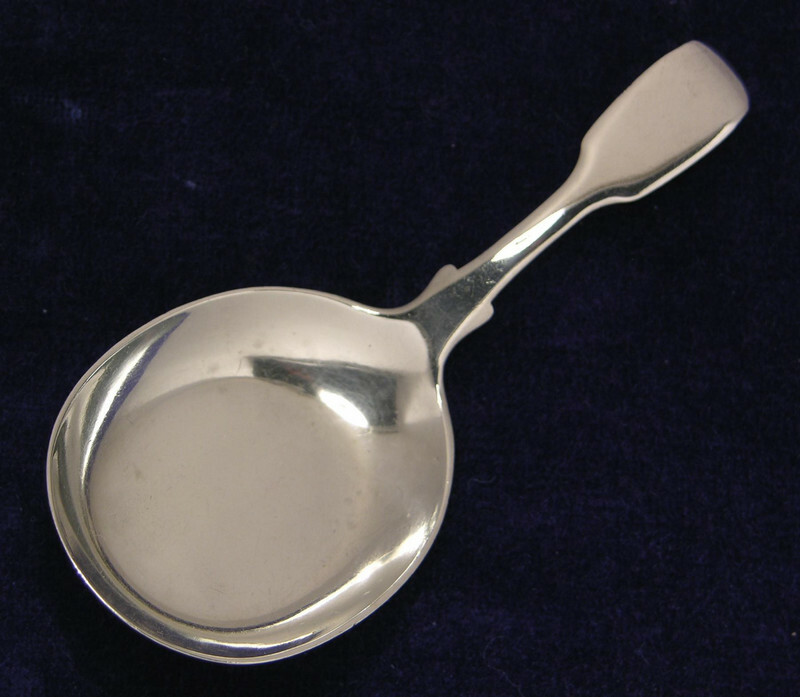 7339 - A VICTORIAN CADDY SPOON - THE CIRCULAR BOWL WITH FLUTED SECTIONS - THE CENTRE WITH A STAR MOTIF - PLAIN HOLLOW HANDLE - BY: 'HILLIARD & THOMASON' - BIRMIGHAM 1865. 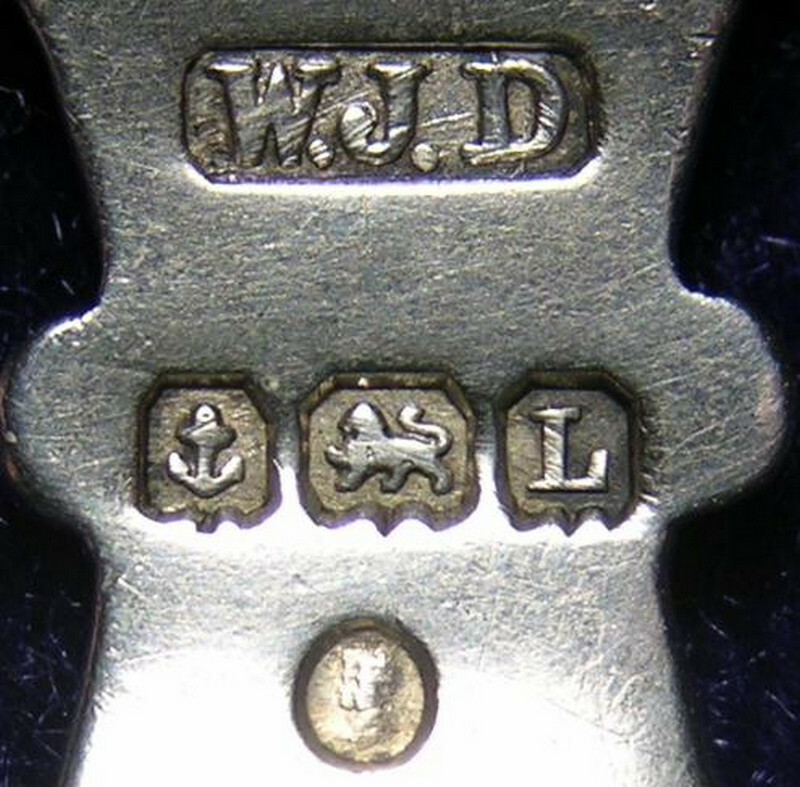 7303 - A V.GOOD MID VICTORIAN PROVINCIAL CADDY - FIDDLE PATTERN & OF GOOD GAUGE - V.WELL MARKED WITH NEW PUNCHES FOR: 'THOMAS SEWELL.I'.- NEWCASTLE 1867. 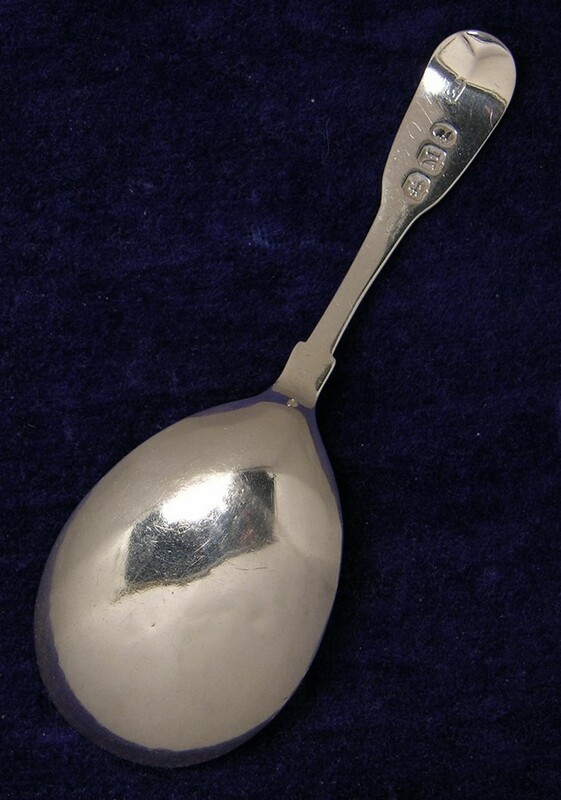 6932 - A GEO.III. 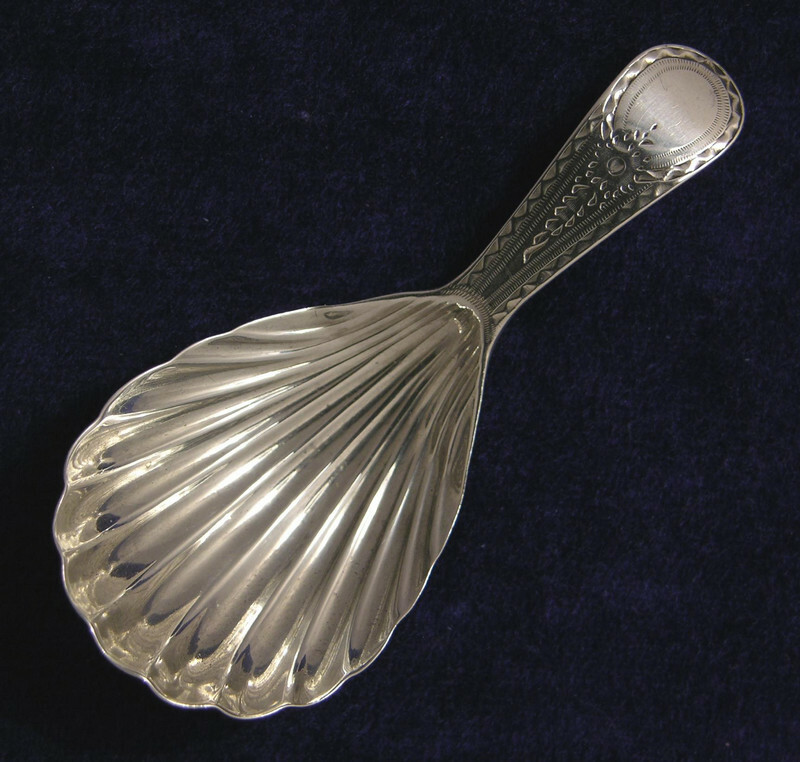 CADDY SPOON - THE DBL FLUTED BOWL WITH CHAMFERED FIDDLE PATTERN HANDLE - BY: 'JOSIAH SNATT' - LONDON 1814. 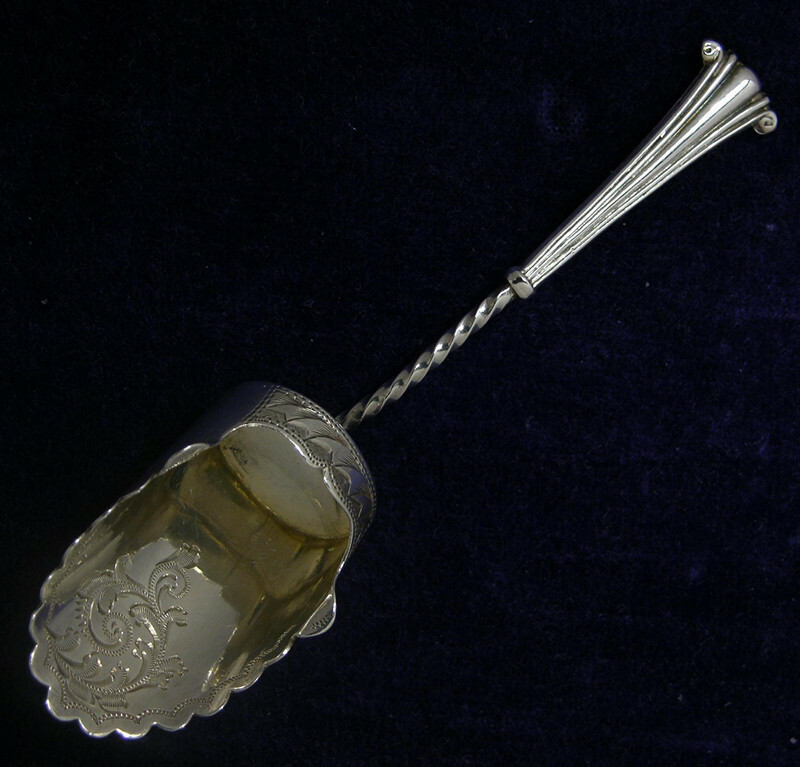 7130 - A WLM.IV. 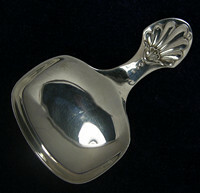 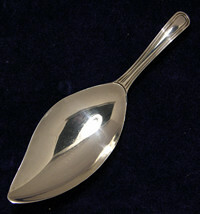 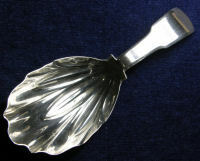 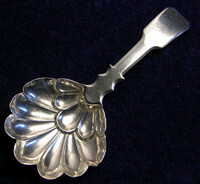 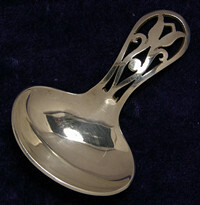 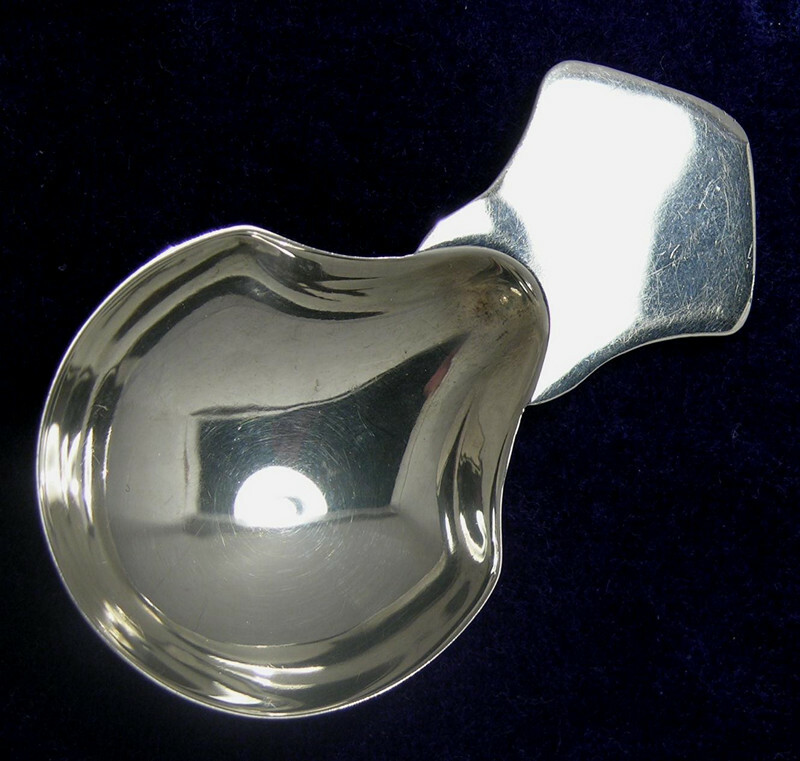 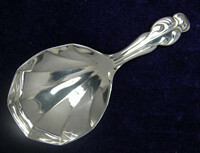 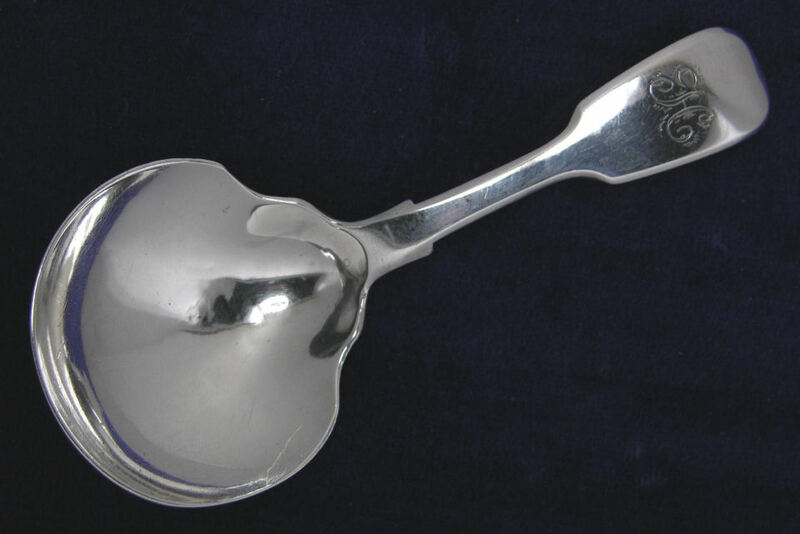 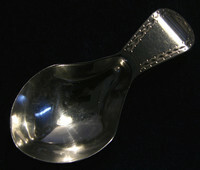 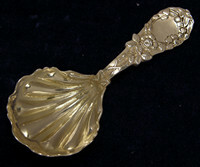 CADDY SPOON - THE DEEP SHIELD SHAPE BOWL WITH FIDDLE PATTERN HANDLE - BY: 'JONATHAN HAYNE' - LONDON 1833. 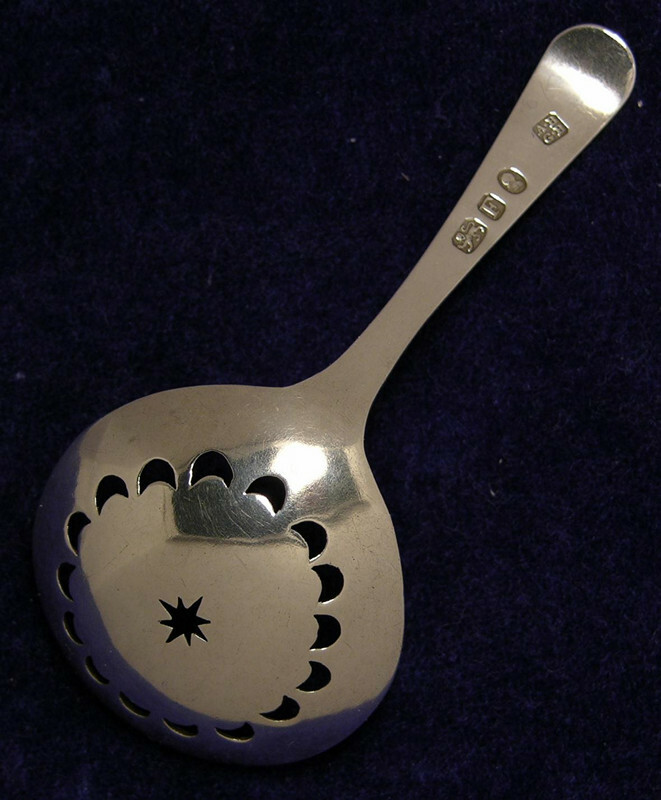 6937 - A GEO.III. CADDY SPOON - THE DEEP DBL FLUTED BOWL WITH CHAMFERED FIDDLE PATTERN HANDLE - BY: 'JOSIAH SNATT' - LONDON 1813. 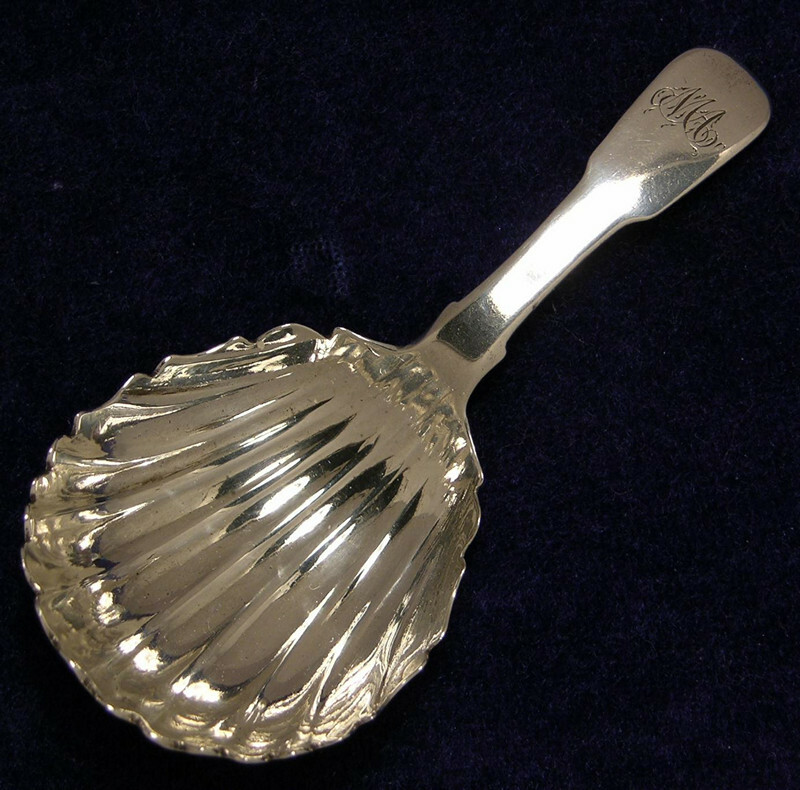 6612 - A WLM.IV. 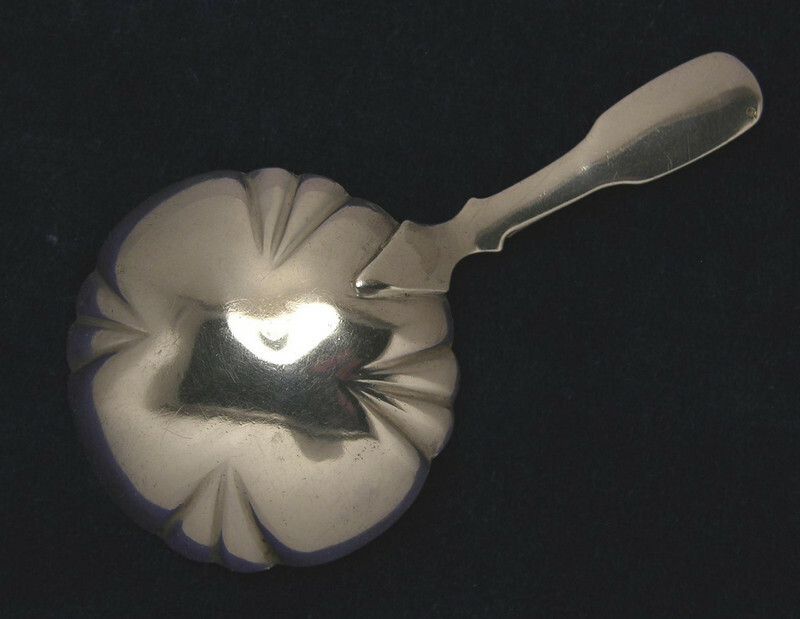 CADDY SPOON - THE LARGE ROUND SHALLOW BOWL TO A PLAIN FIDDLE HANDLE - BY: 'FRANCIS POWELL' - LONDON 1833. 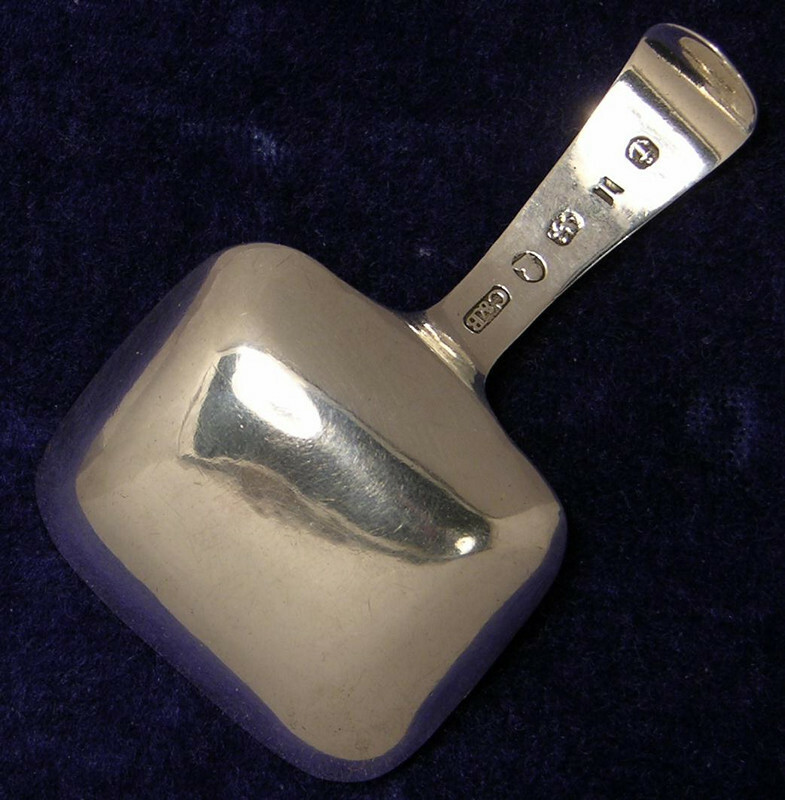 5693 - A GEO.III. 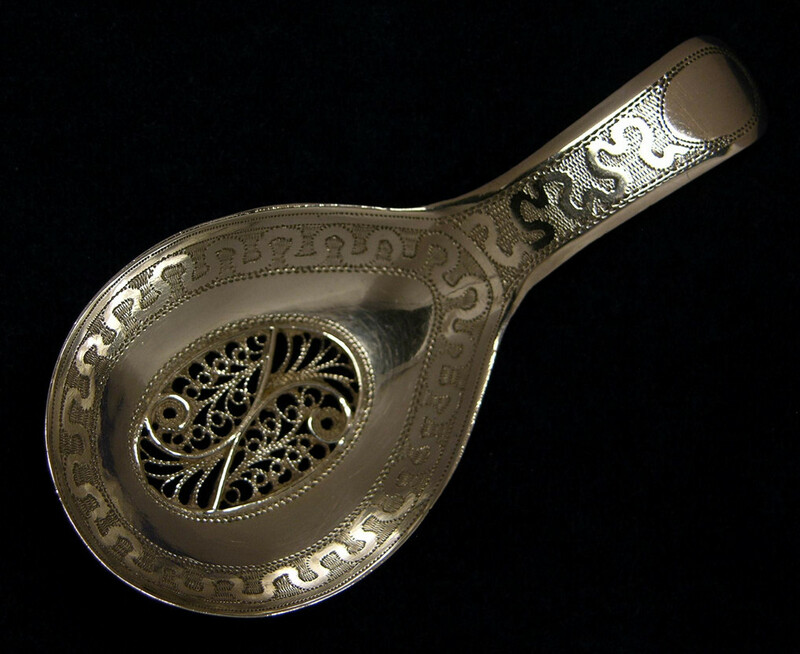 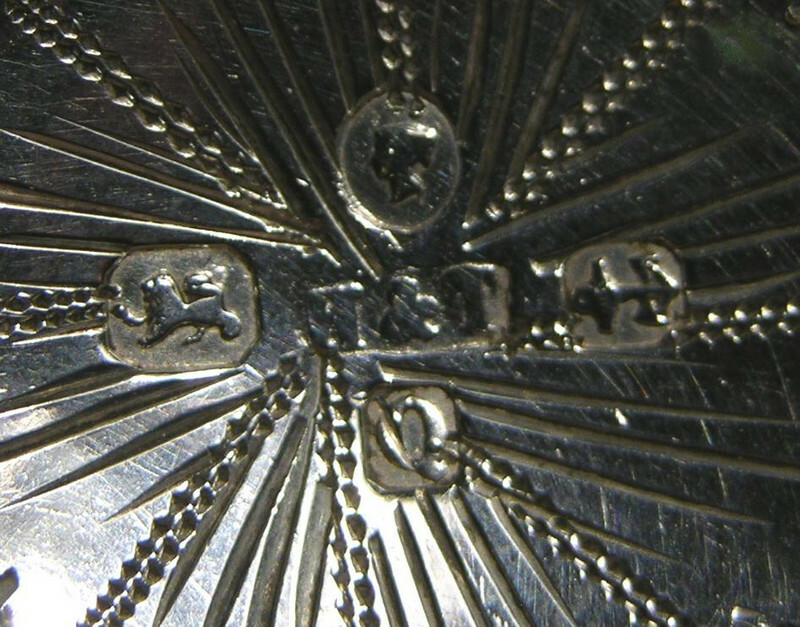 CADDY SPOON - THE SHIELD SHAPED BOWL ALSO NICELY ENGRAVED WITH A SHIELD & BRIGHT ENGRAVED HANDLE - BY: 'JOSEPH TAYLOR' - BIRMINGHAM 1801. 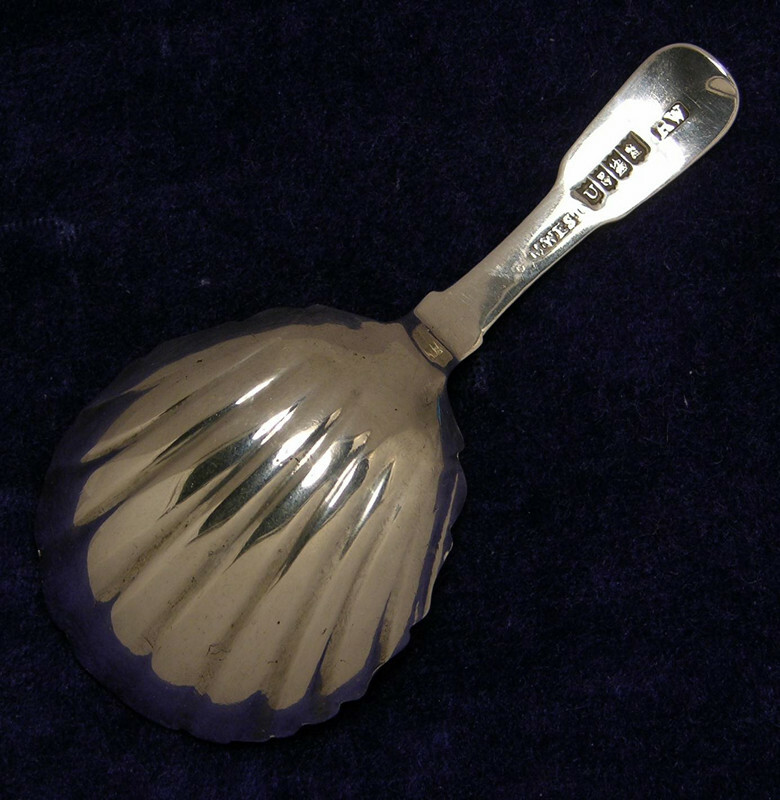 7127 - A 'FINE' GEO.III. 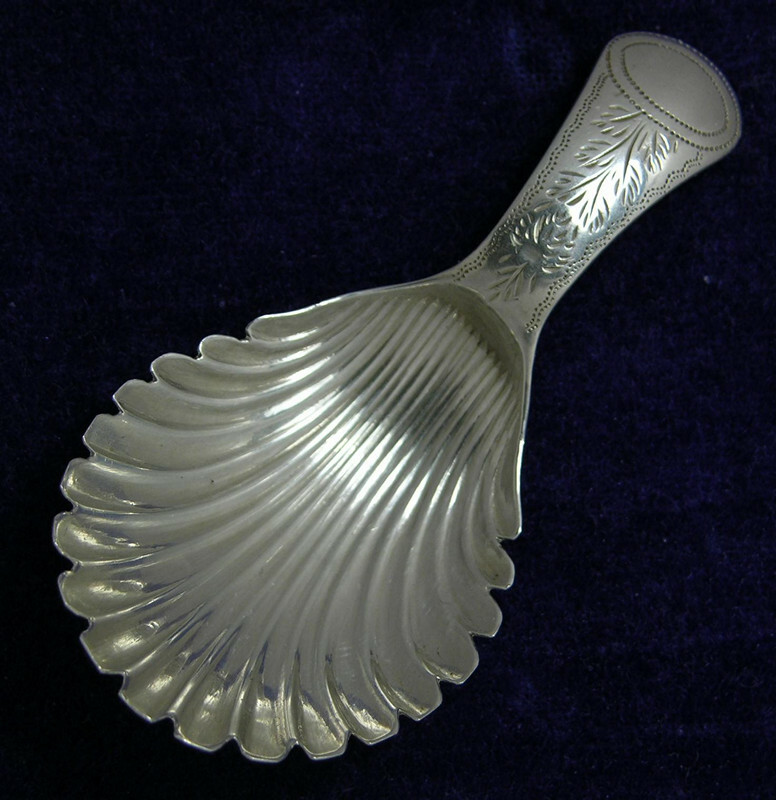 IRISH CADDY SPOON - THE DEEP EXTENDED FLUTED BOWL WITH FIDDLE HANDLE - WELL MARKED WITH AN EARLY DATE FOR: 'WILLIAM CUMMINS' - DUBLIN 1813. 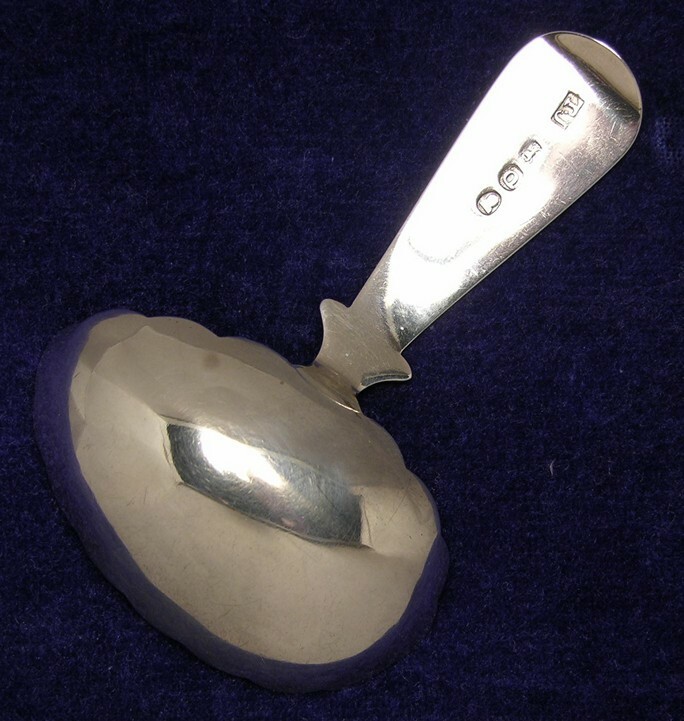 7018 - A 'FINE' GEO.III. 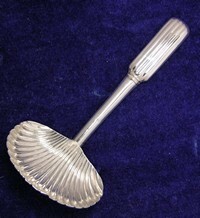 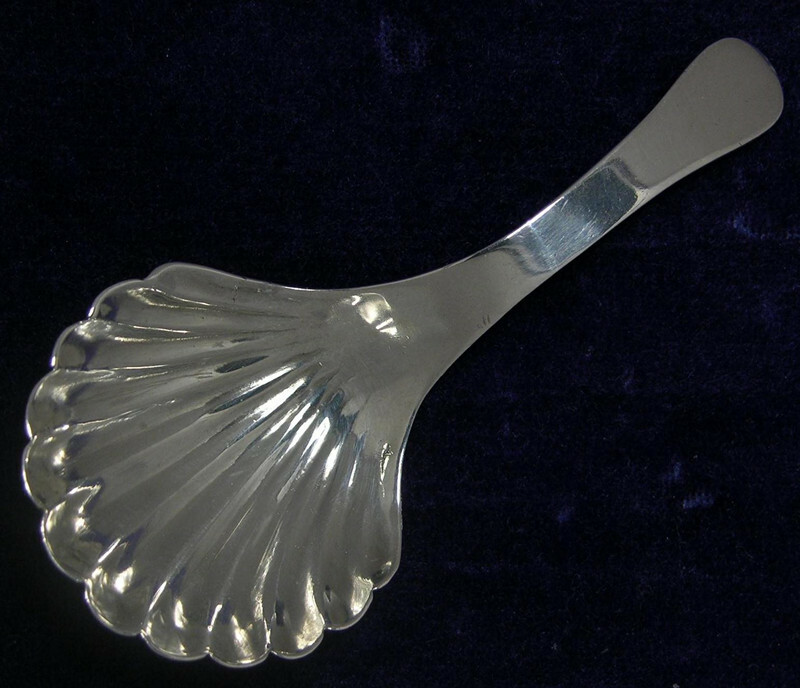 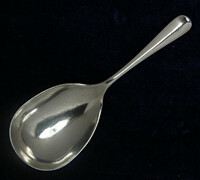 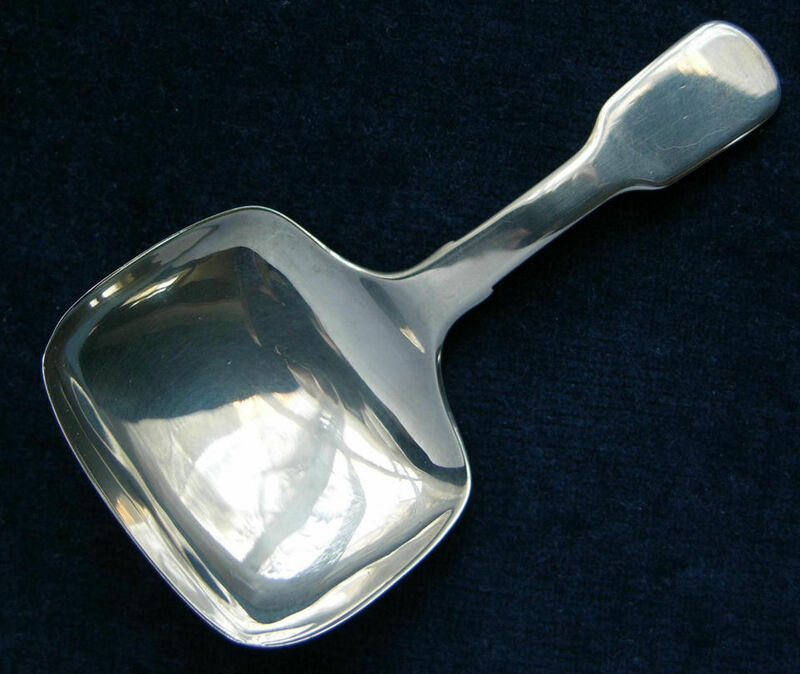 CADDY SPOON - THE WIDE FLUTED BOWL WITH BRIGHT-CUT HANDLE - BY: 'PETER & ANNE BATEMAN' - LONDON 1795. 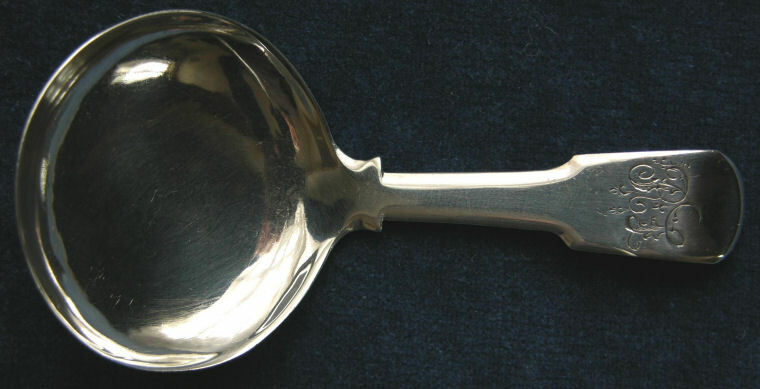 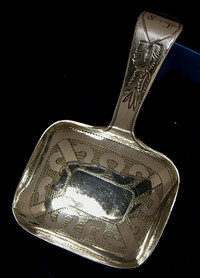 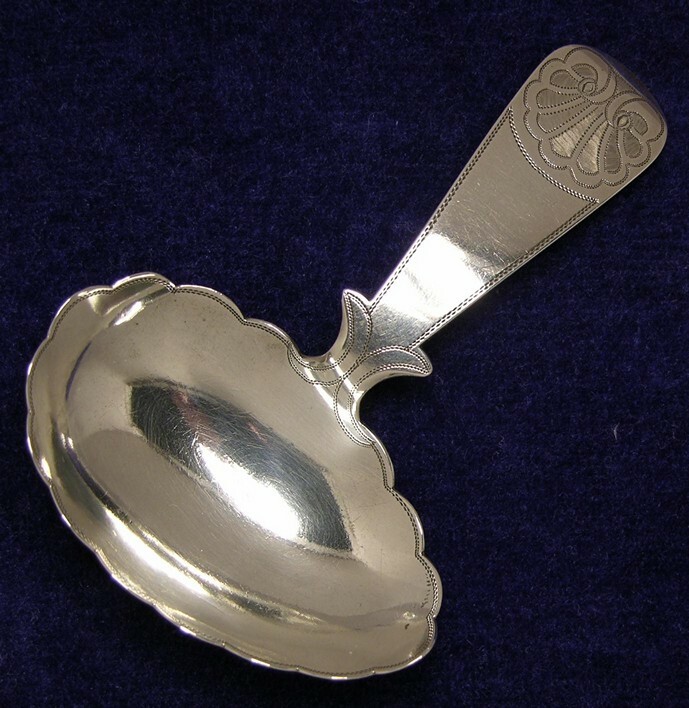 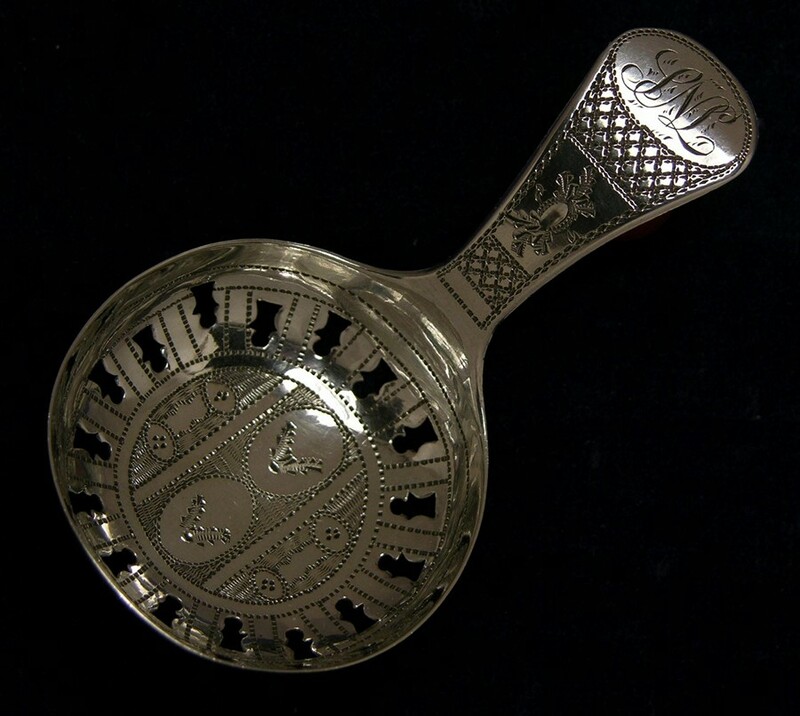 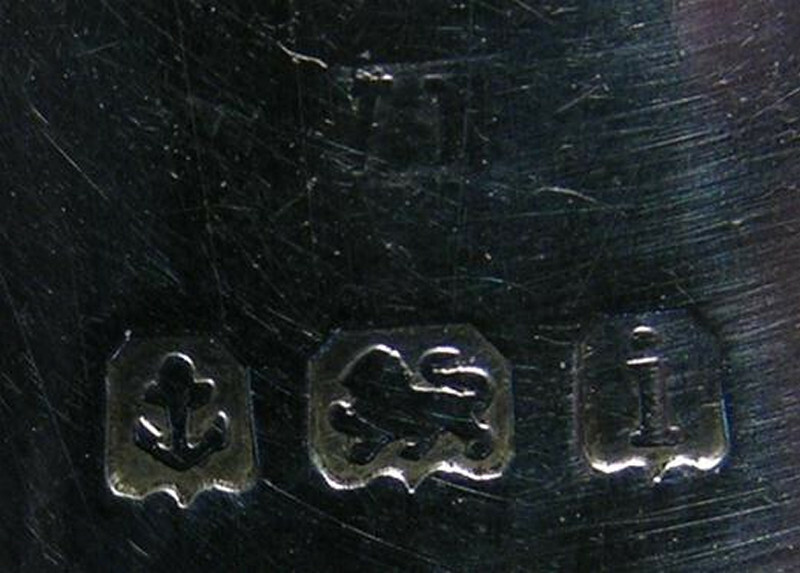 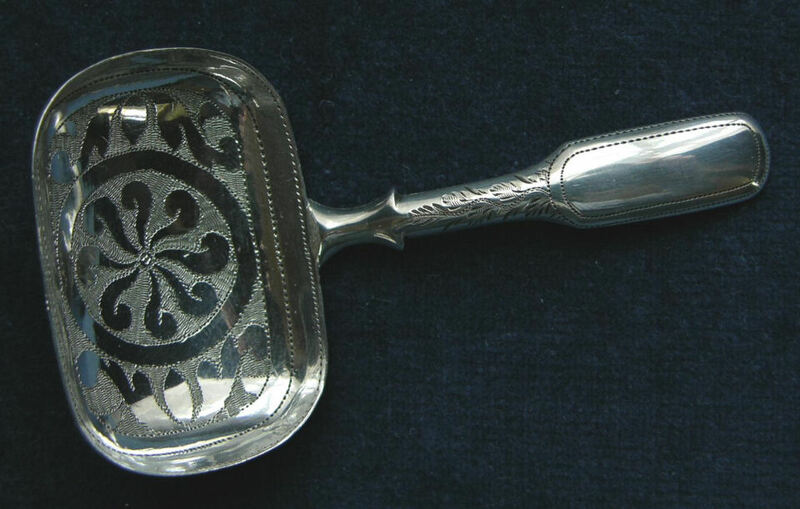 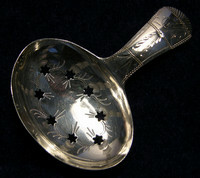 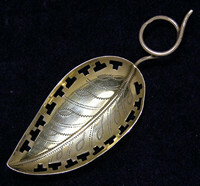 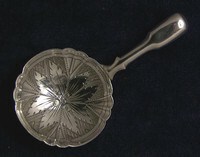 7304 - A PROVINCIAL 'FRYING PAN' BOWL CADDY SPOON - BY: 'GEORGE FERRIS' - EXETER 1821. 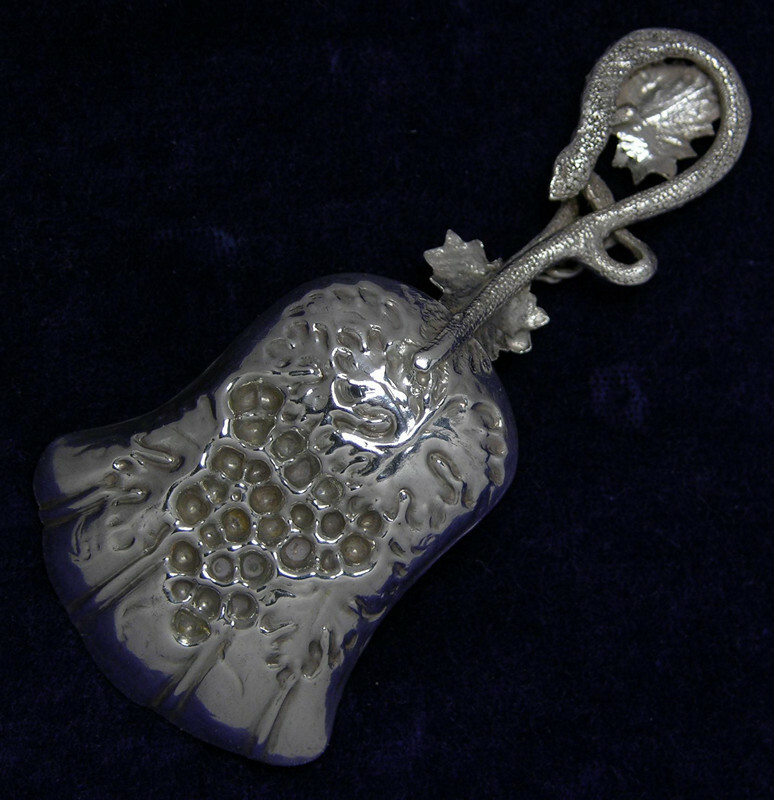 7305 - A CHARMING GEO.V. 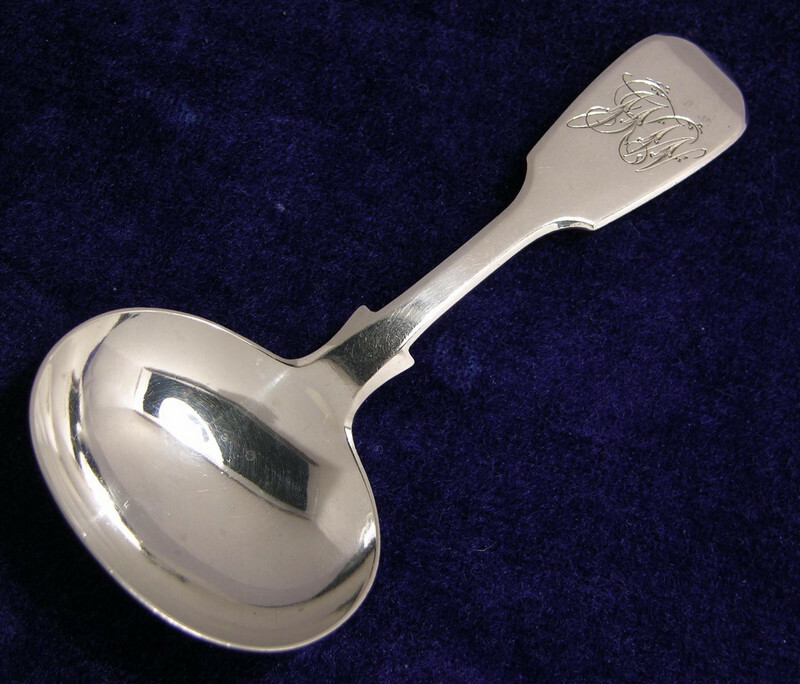 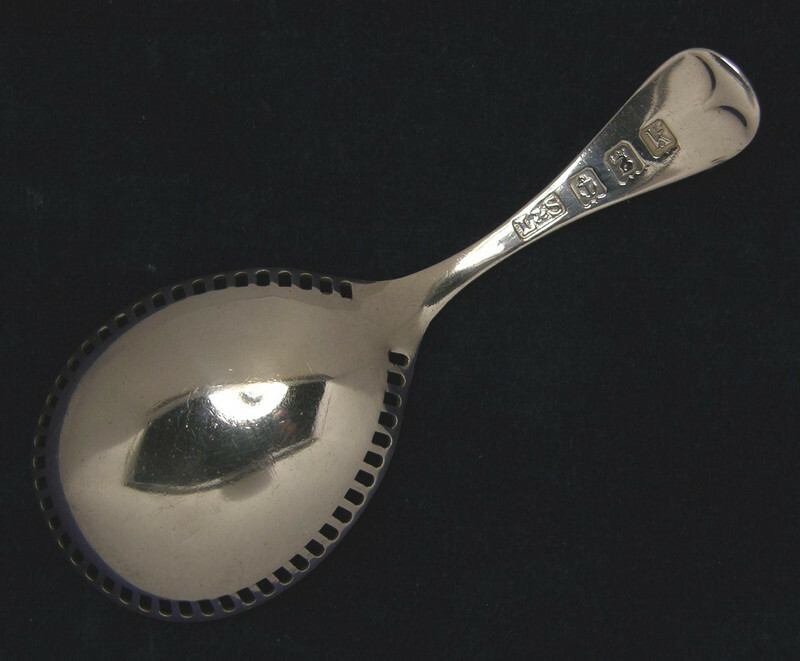 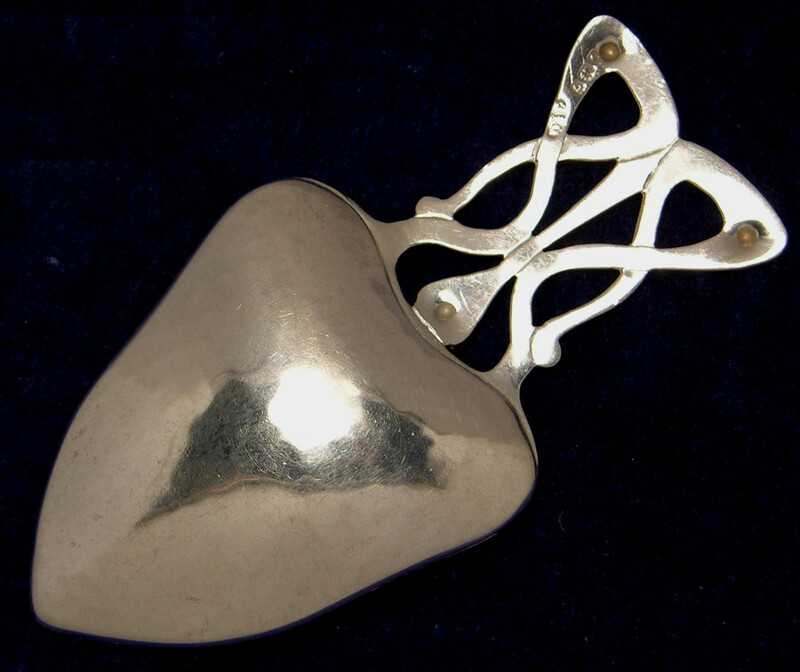 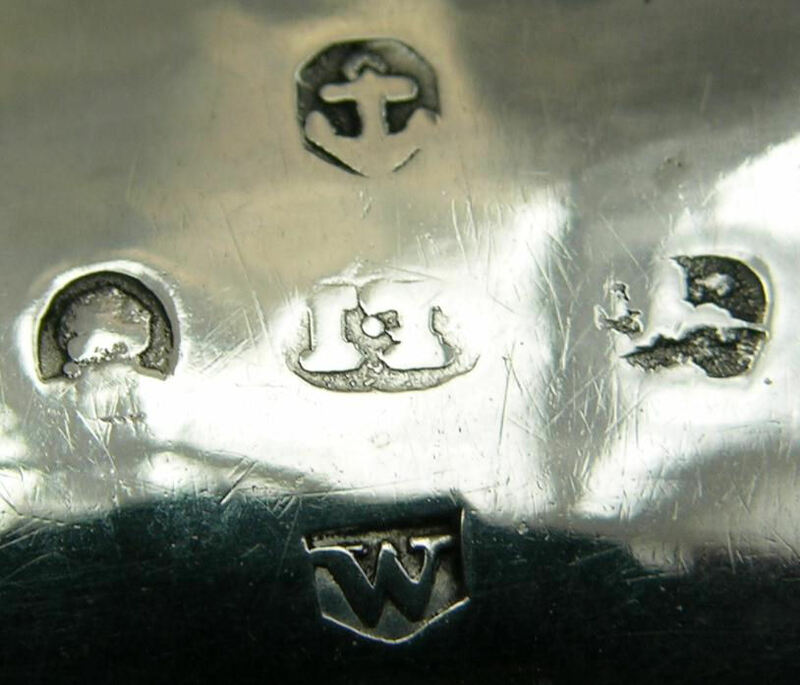 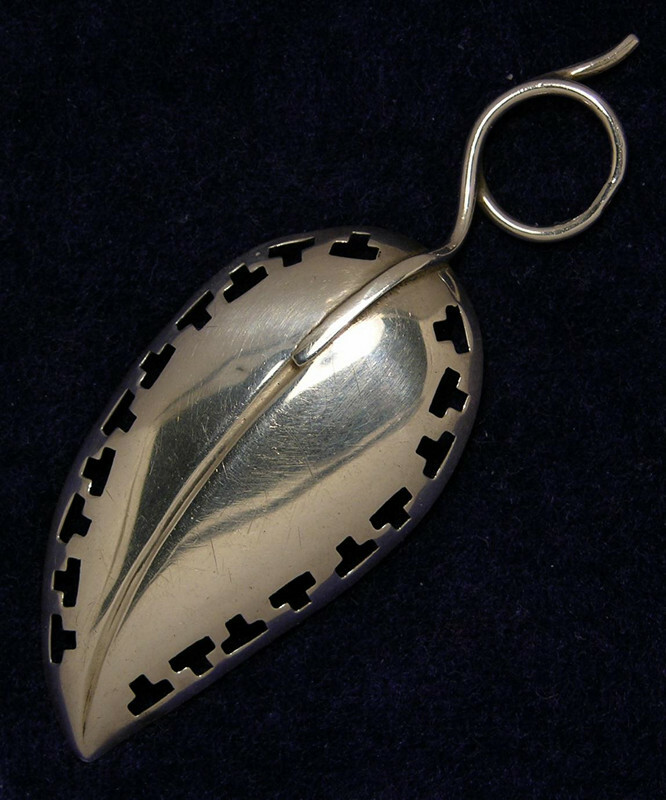 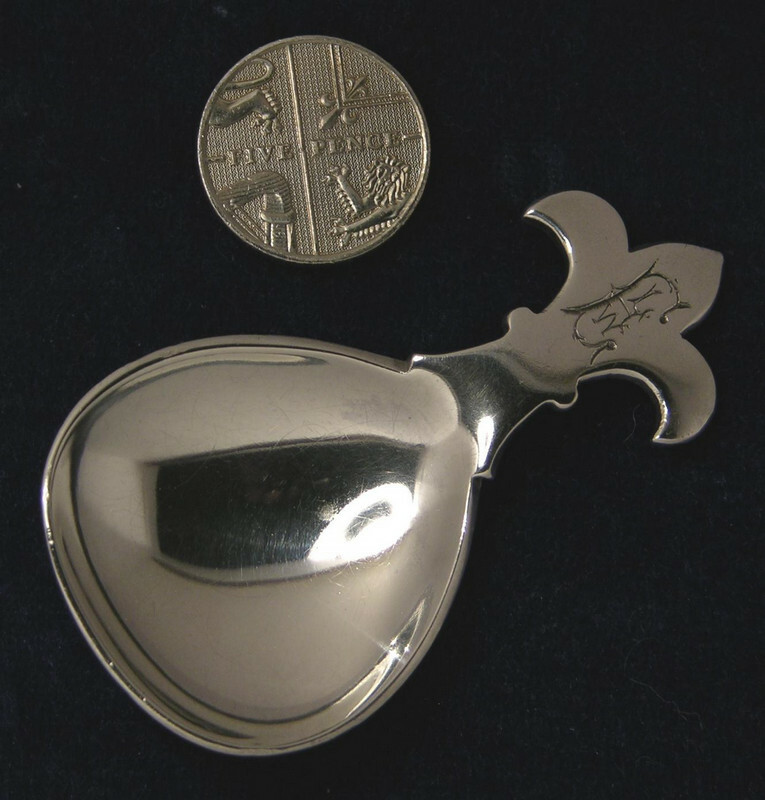 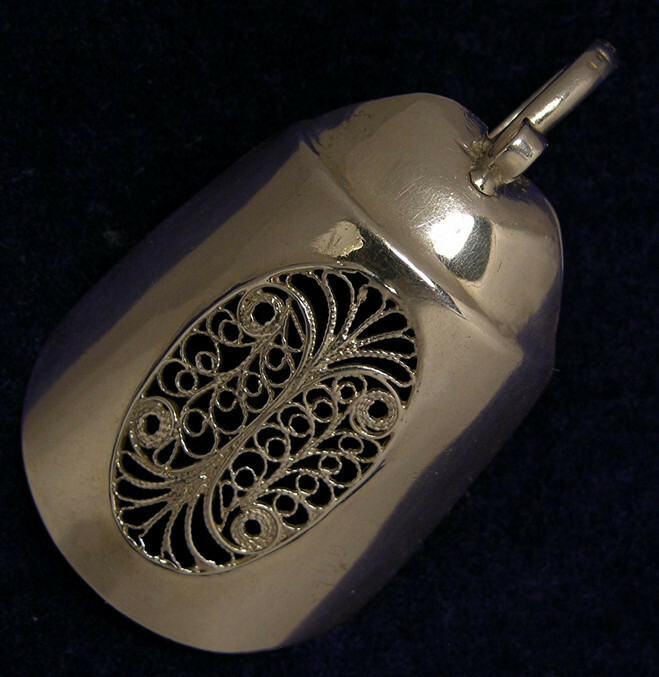 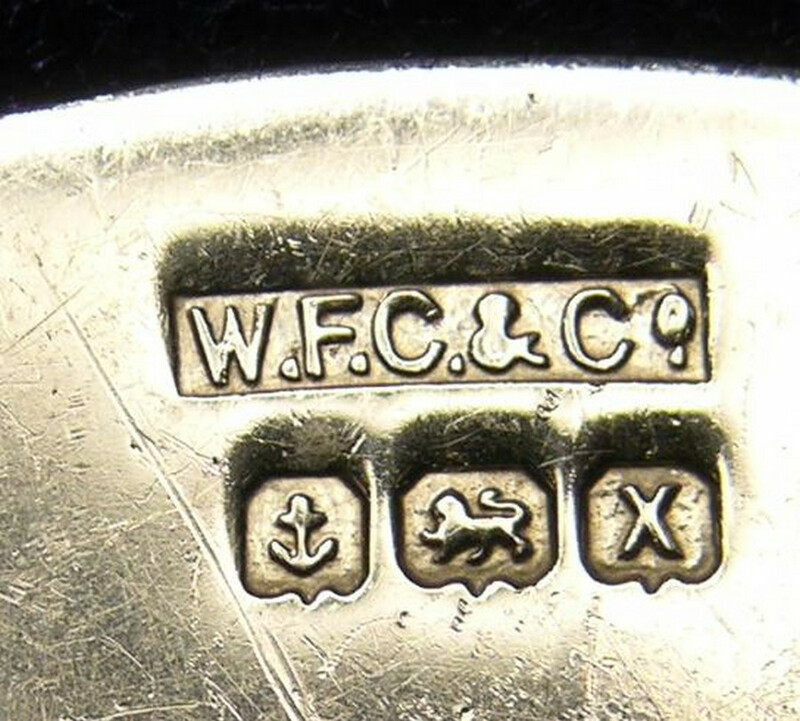 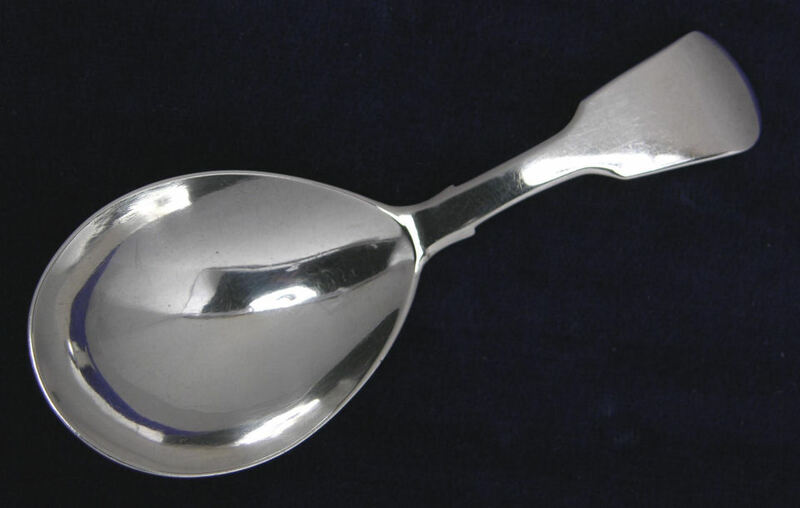 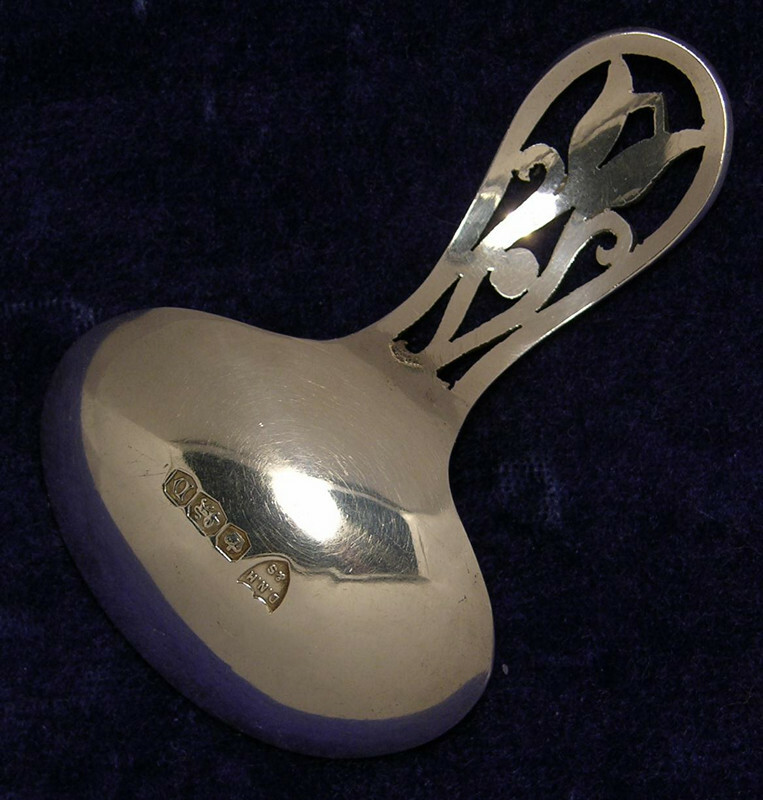 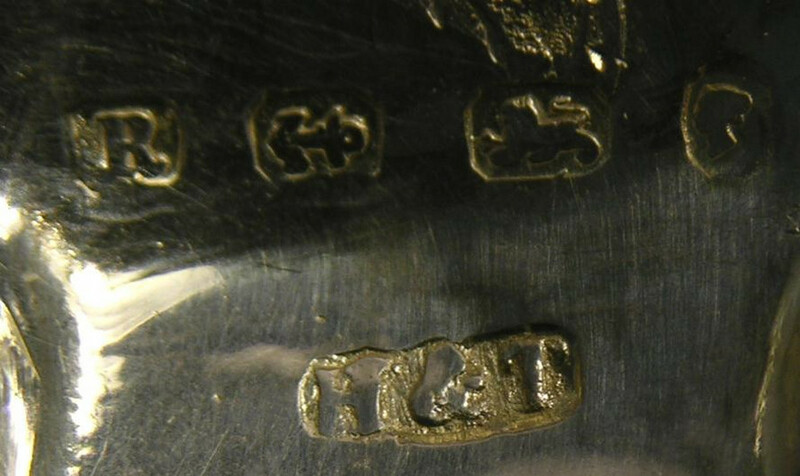 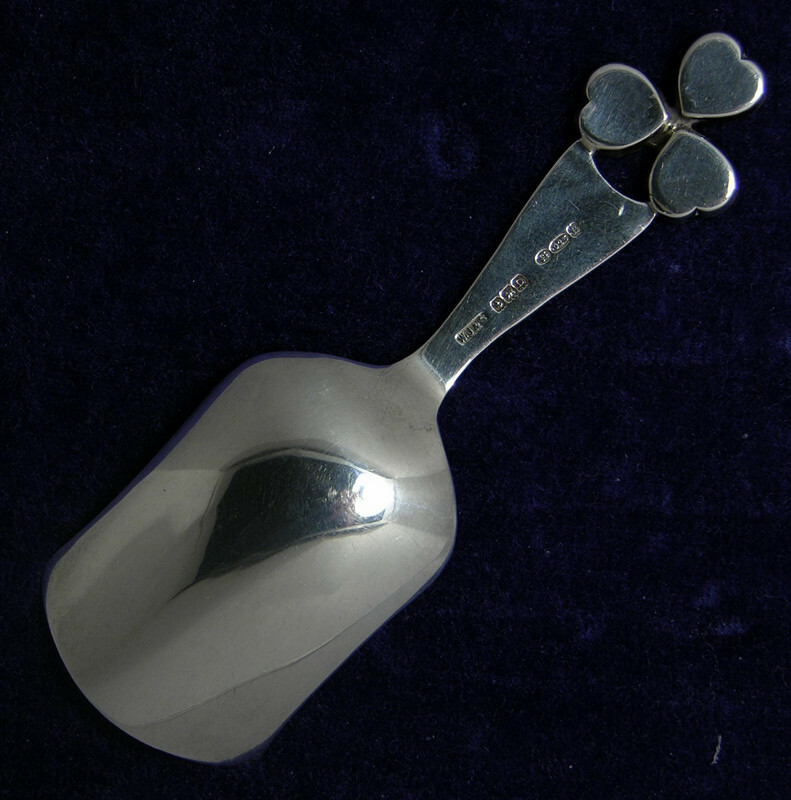 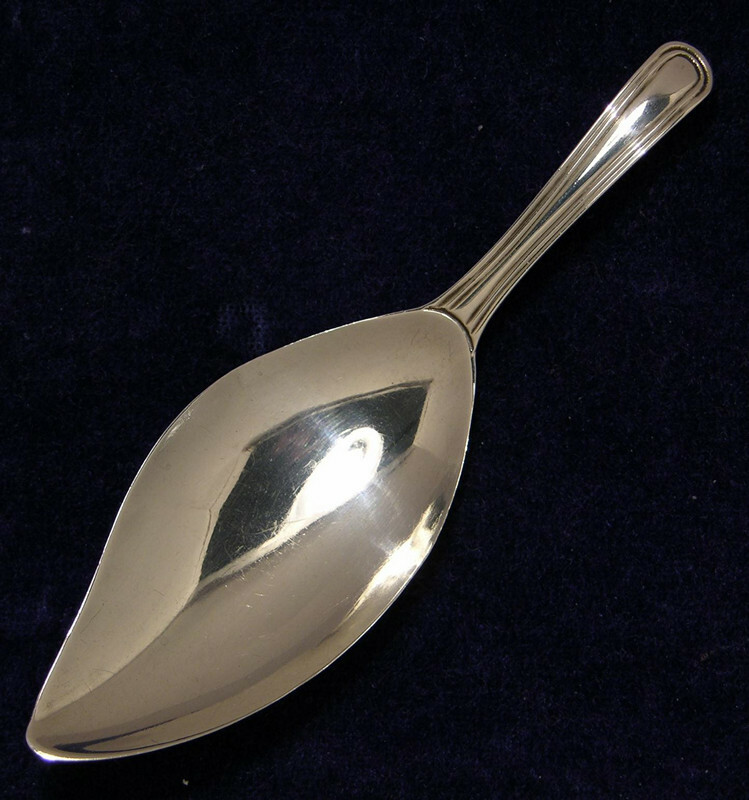 CADDY SPOON OF UNUSUALLY SMALL SIZE & HEAVY GAUGE - THE PEAR SHAPED BOWL WITH NICELY ENGRAVED 'FLEUR-DE-LYS' GRIP - BY: 'WILLIAM JAMES DINGLEY' - LONDON 1935. 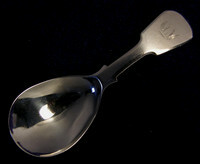 7128 - A GEO.III. 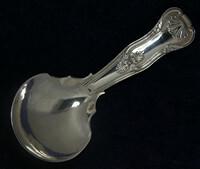 CADDY SPOON - DEEP PEAR SHAPED BOWL WITH FIDDLE & THREAD HANDLE - BY: 'WILLIAM SEAMAN' - LONDON 1804. 7129 - A GEO.III. CADDY SPOON - THE DEEP PEAR SHAPED BOWL WITH FLARED FIDDLE HANDLE - BY: 'THOMAS FREETH' - LONDON 1816. 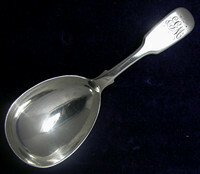 6941 - A GEO.IV. 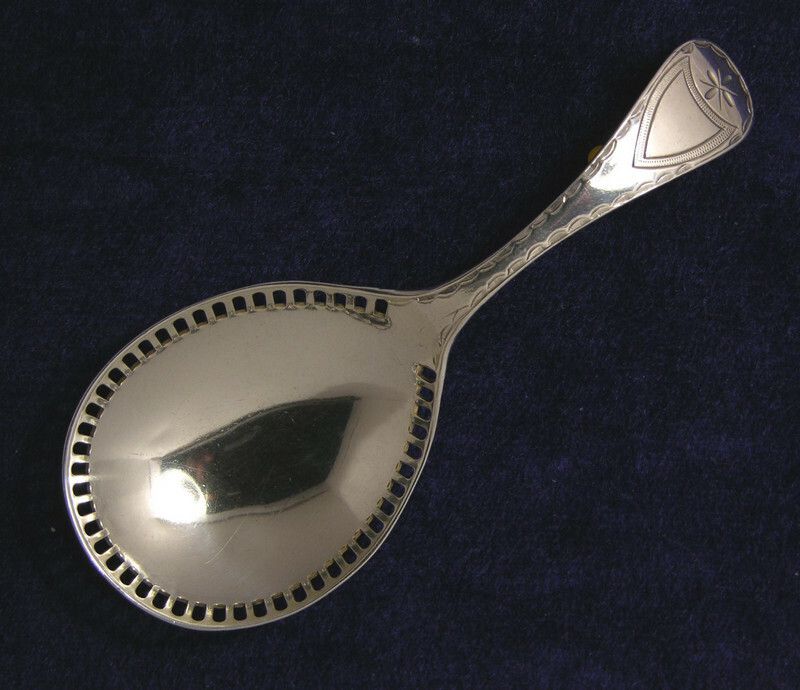 CADDY SPOON - THE ROUNDED RECTANGULAR BOWL VERY WELL DECORATED & WITH AN ENGRAVED HOLLOW HANDLE - BY: 'JOSEPH TAYLOR' - BIRMINGHAM 1820. 6940 - A 'V.GOOD' GEO.III. 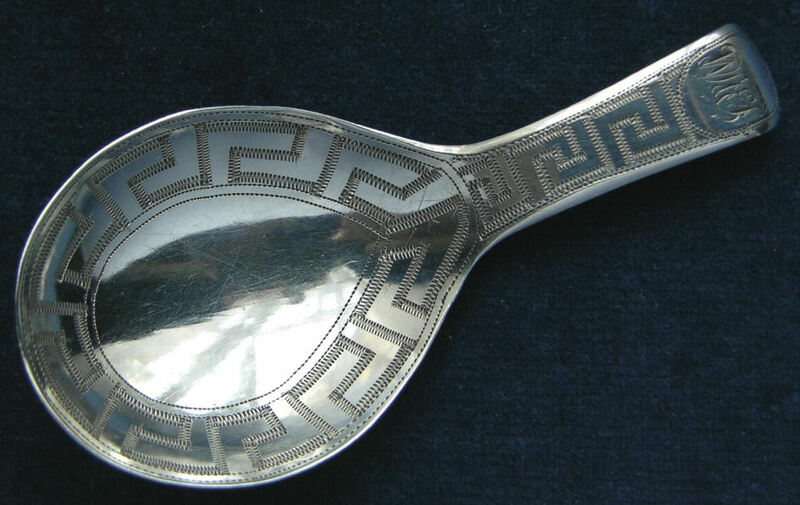 CADDY SPOON - THE OVAL BOWL AND HANDLE STRONGLY DECORATED WITH A 'GREEK KEY' PATTERN - BY: 'SAMUEL PEMBERTON' - BIRMINGHAM 1804. 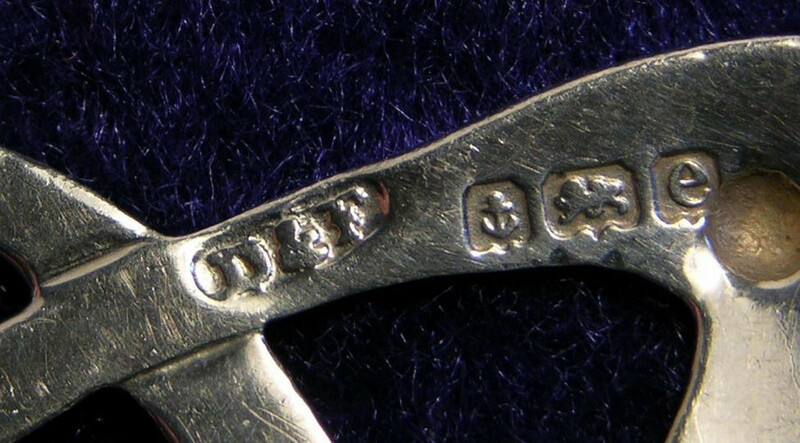 6936 - A 'FINE & SCARCE' GEO.III. 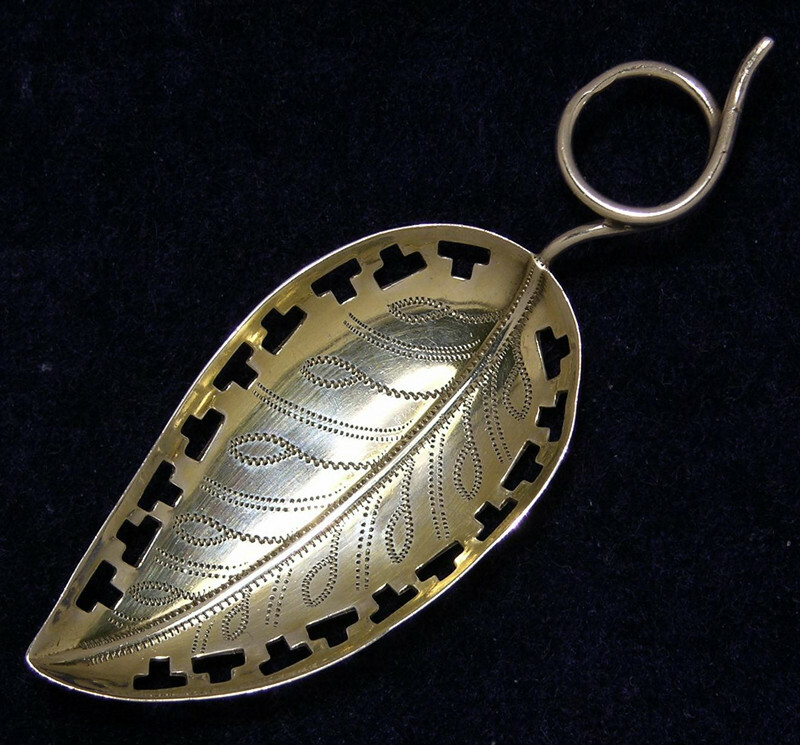 CADDY SPOON - THE LONG LEAF SHAPED BOWL WITH BEADED HANDLE - BY: 'THOMAS WALLIS' - LONDON 1799. 6934 - AN EARLY VICTORIAN CADDY SPOON - THE ROUNDED RECTANGULAR BOWL WITH CHAMFERED HANDLE - BY: 'JOSEPH WILMORE' - BIRMINGHAM 1837. 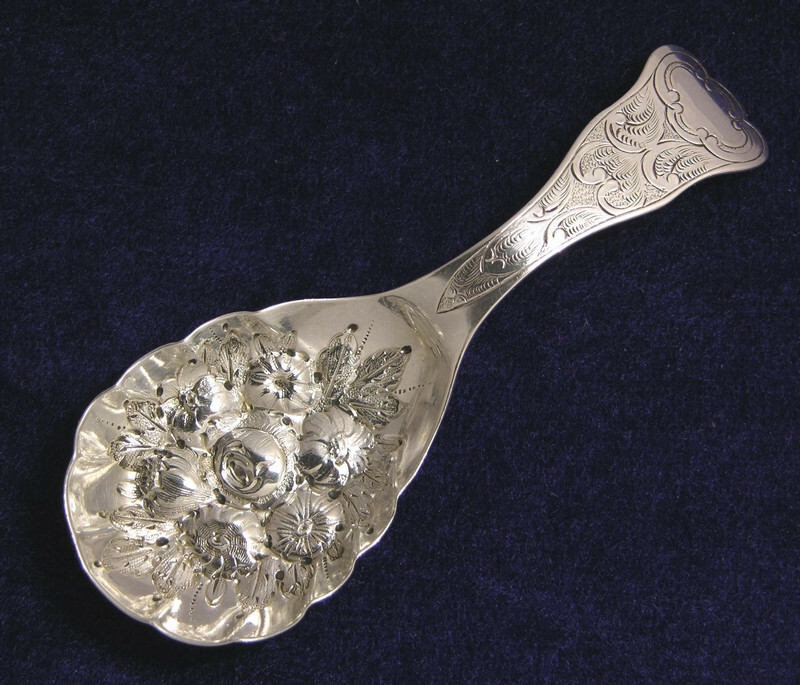 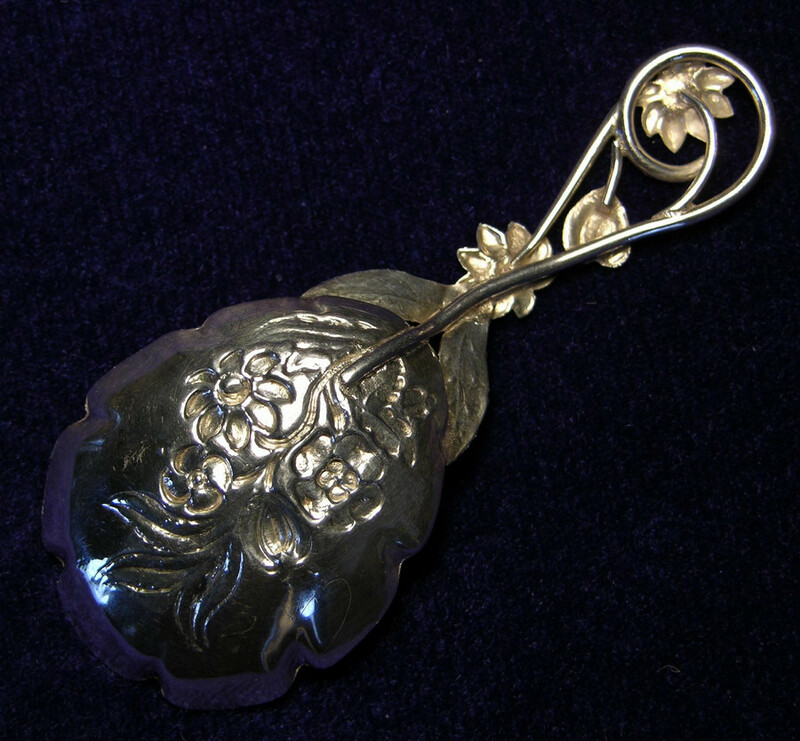 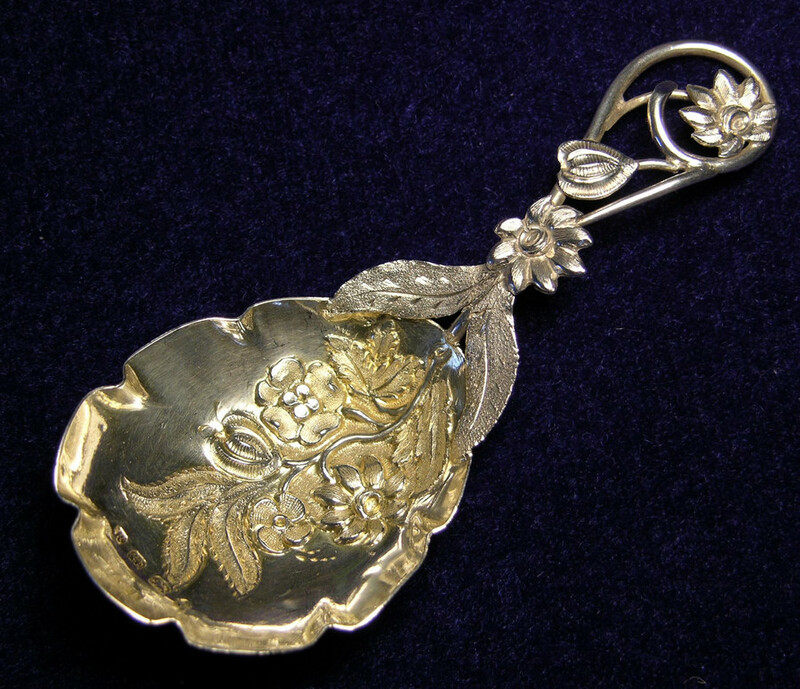 6496 - A 'FINE' EARLY VICTORIAN CADDY SPOON - THE SCALLOPED BOWL EMBOSSED WITH FLOWERS - THE HOLLOW LOOP HANDLE WITH APPLIED TENDRIL & FRUITING VINE - BY: 'GEORGE UNITE' - BIRMINGHAM 1848.